I can remember quite well the day when I was standing in front of a glass wall in the zoo of Zürich observing a golden lion tamarin sitting on a tree trunk and looking into my direction. Sometimes it was calling. 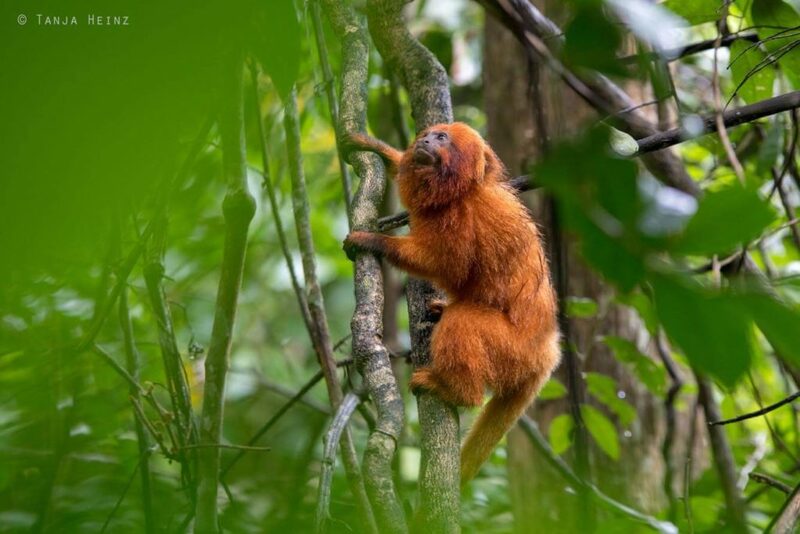 I immediately thought of the chapter about golden lion tamarins in the book from Jane Goodall “Hope for Animals and Their World – How Endangered Species Are Being Rescued from the Brink”. In this book Jane Goodall shares stories about animals, that almost disappeared from our earth. The California Condor (Gymnogyps californianus), the Northern bald ibis (Geronticus eremita) or the Iberian lynx (Lynx pardinus) were one of these animals. 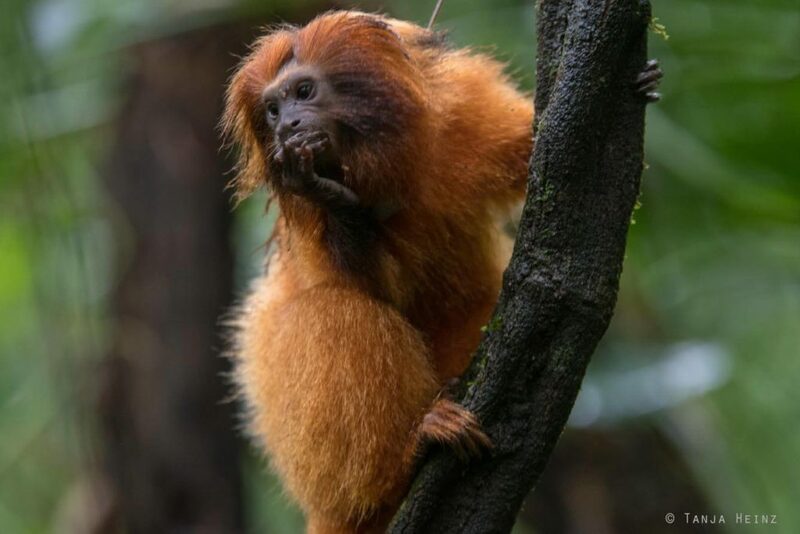 But also golden lion tamarins (Leontopithecus rosalia). 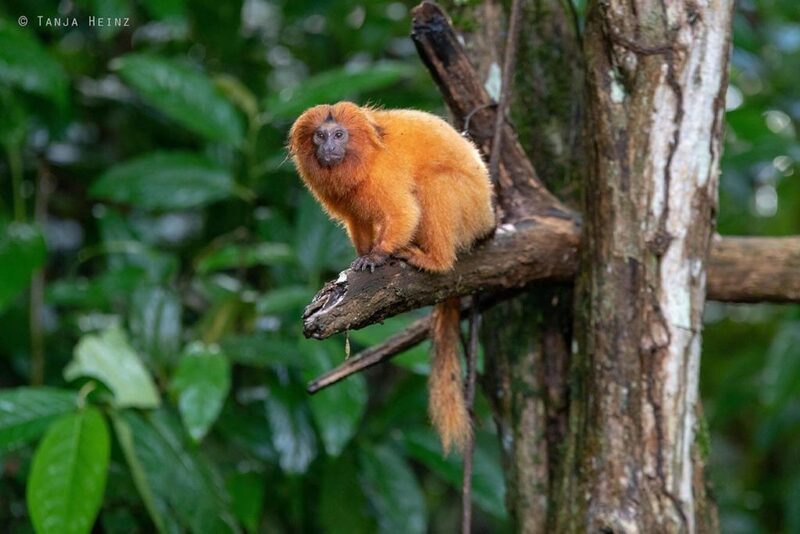 When I was standing in front of this glass wall I never would have thought of being able to see golden lion tamarins in their natural environment in the Atlantic Forest of Brazil. 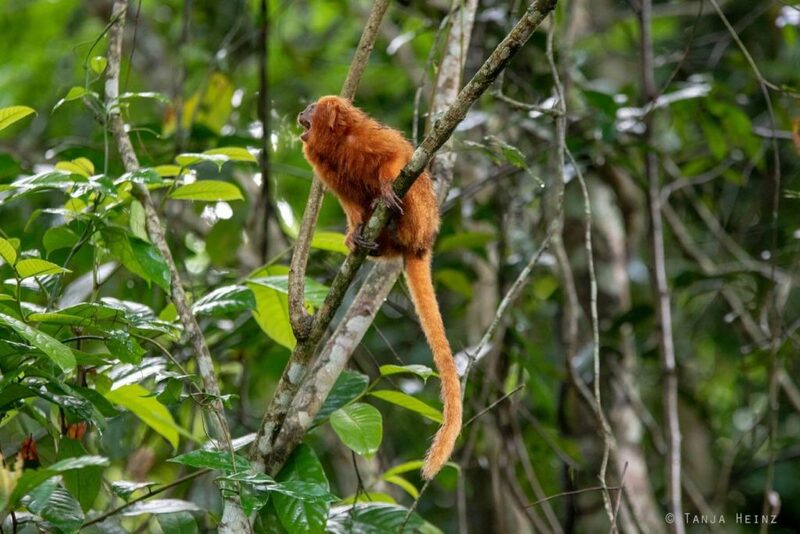 I could realize my encounter with the golden lion tamarins thanks to the Associação Mico-Leão-Dourado in the Reserva Biológica de Poço das Antas in the state of Rio de Janeiro. 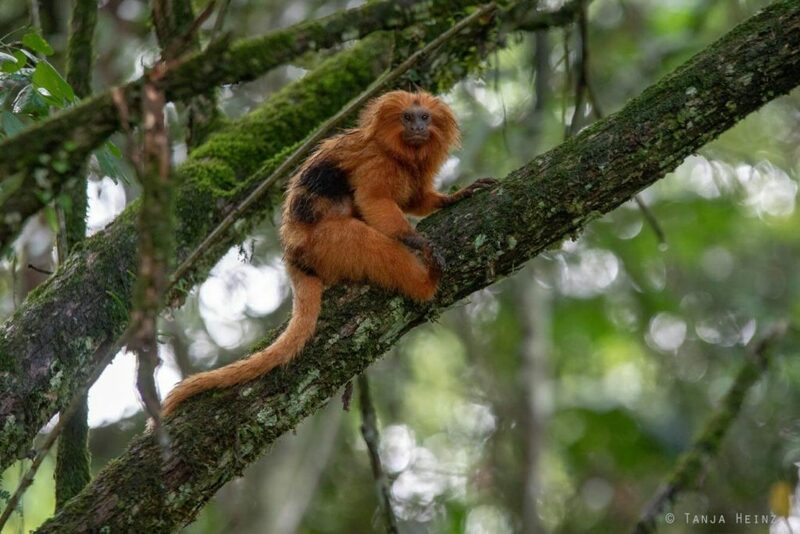 Mico-Leão-Dourado is Portuguese and means – as you probably guess – golden lion tamarin. 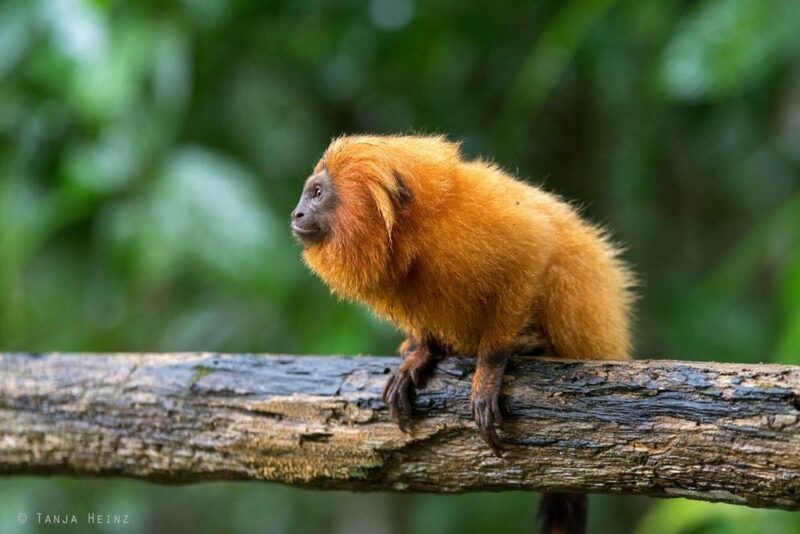 In the early 60s there were only a few golden lion tamarins left in the wild. To be more precisely, there were only about 200 of them left in the forests of Rio de Janeiro. 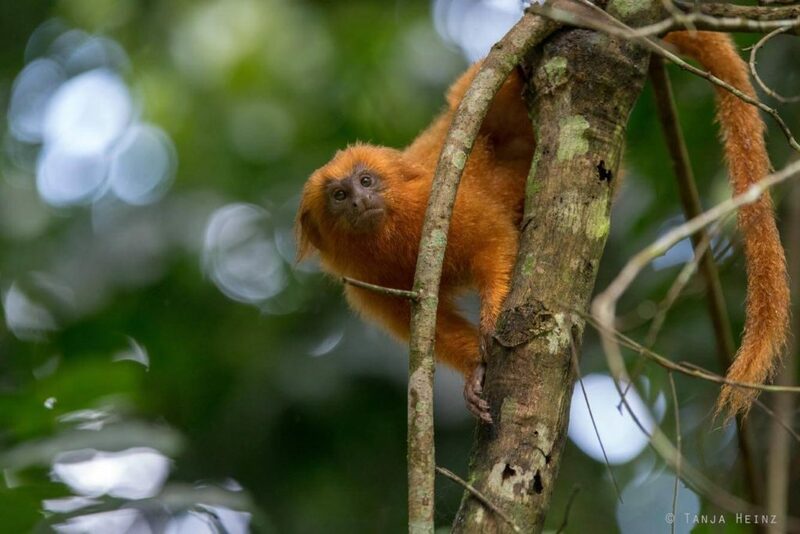 It was in these years that first conservation plans for golden lion tamarins in the Atlantic Forest in Rio de Janeiro evolved that were initiated by dedicated people. 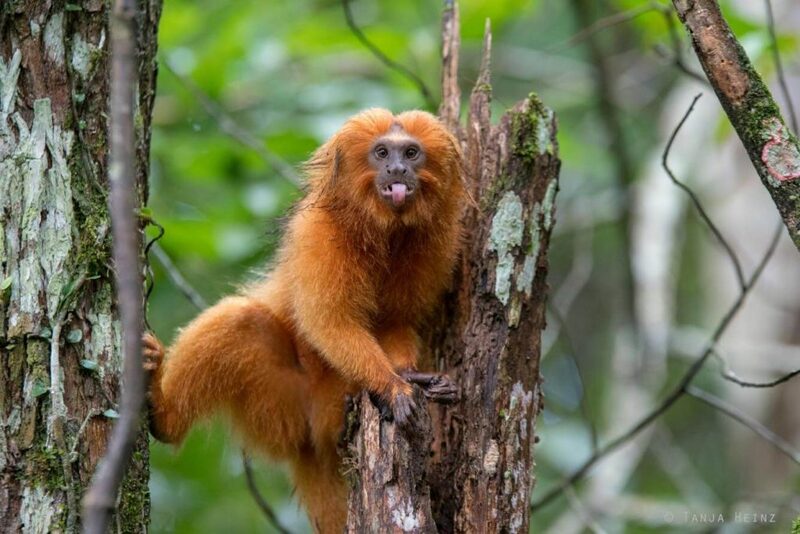 As golden lion tamarins are endemic, that means they only occur in the Atlantic Forest in Rio de Janeiro, the low number of these animals was especially alarming. 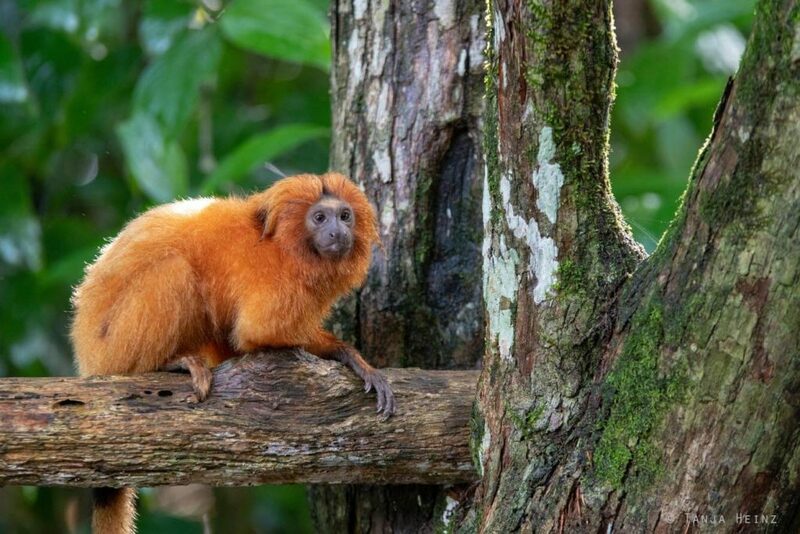 In cooperation between institutes in Brazil and the United States a progrem was established to prevent the extinction of golden lion tamarions in the wild. 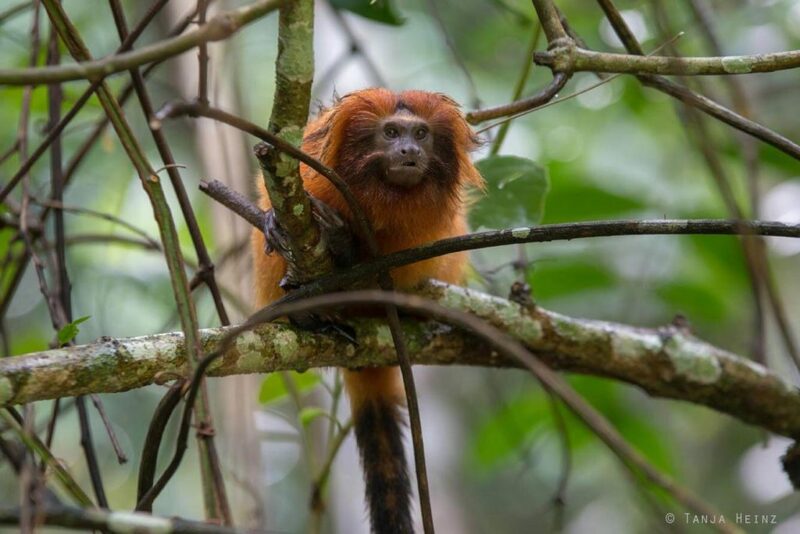 In 1992 the Associação Mico-Leão-Dourado was finally founded which is now the principal contact point with respect to the conservation of golden lion tamarins in Brazil. 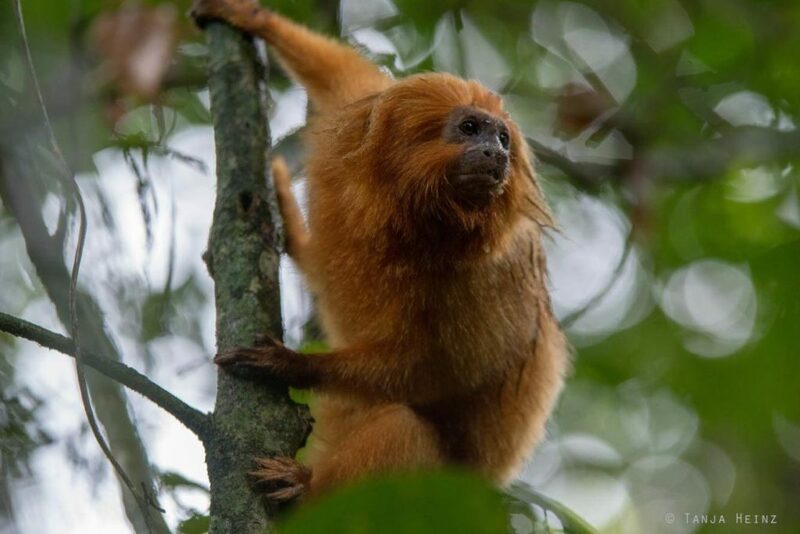 As habitat destruction was one of the main reasons why the number of golden lion tamarins had decreased dramatically in the Atlantic Forest, it is important to mention here, that in 1974 the Reserva Biológica de Poço das Antas was established. 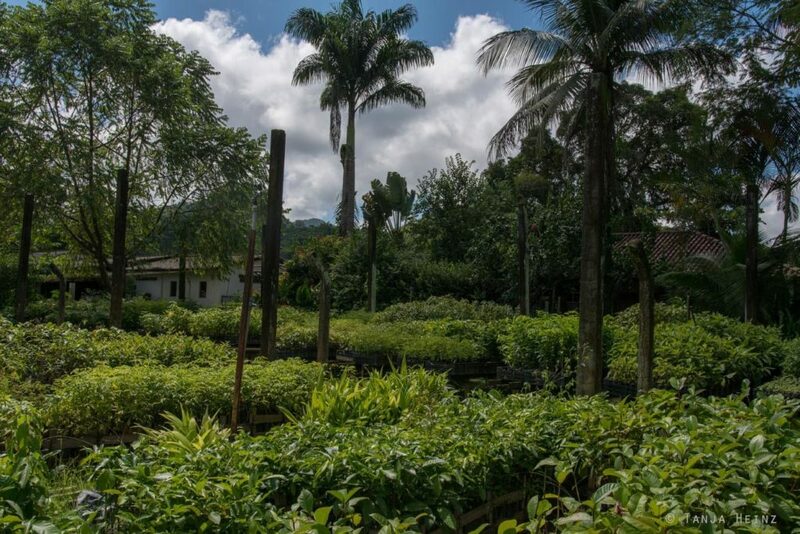 The Reserva Biológica de Poço das Antas extends over the municipalities of Silva Jardim and Casimiro de Abreu in the state Rio de Janeiro. From the Reserva Biológica de Poço das Antas it is about 120 kilometers to the city of Rio de Janeiro. 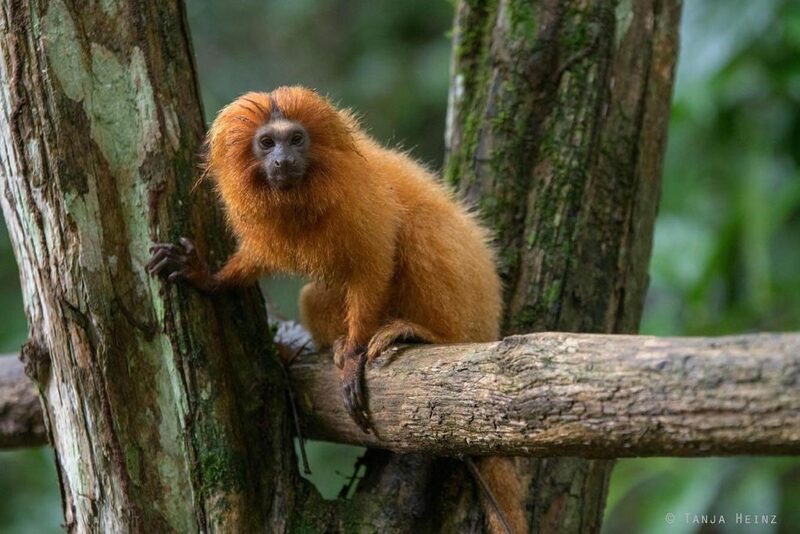 Thanks to the Associação Mico-Leão-Dourado and its cooperations more than 1.000 golden lion tamarins live nowadays in the wild in forests of Rio de Janeiro according to the IUCN. 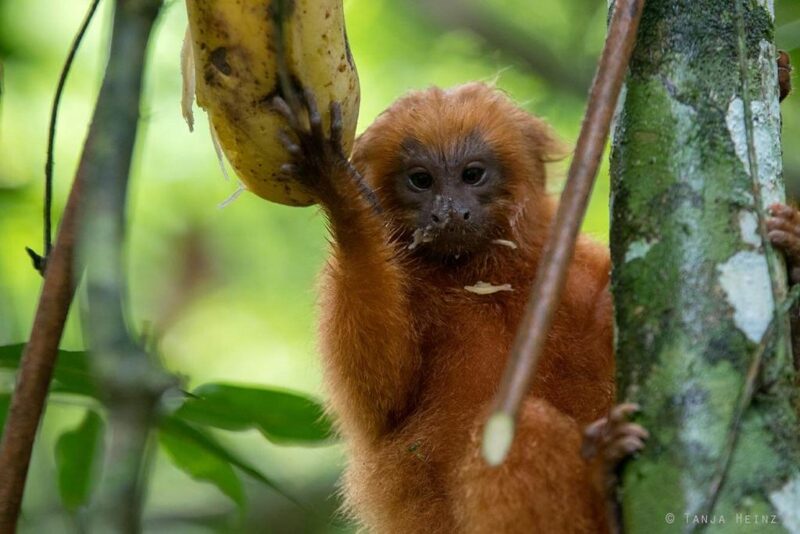 However, it is estimated that now about 3.200 golden lion tamarins live in their natural environment. 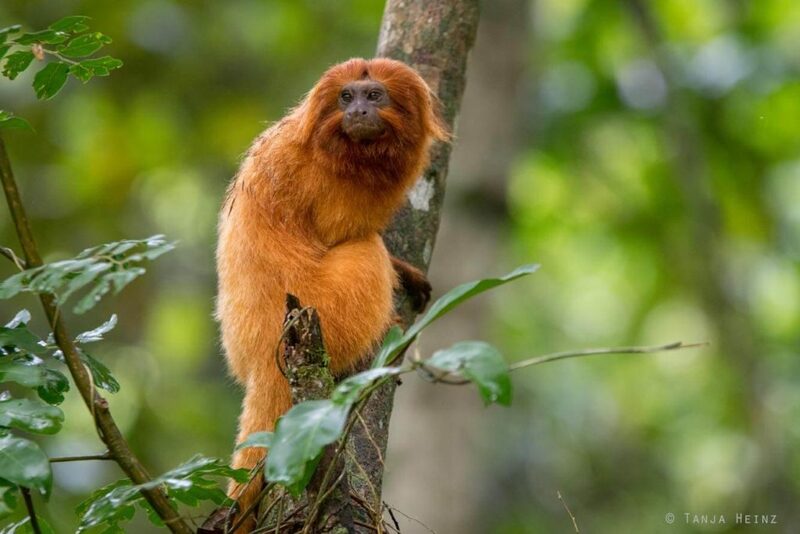 Nevertheless, golden lion tamarins are still “endangered” accourding to the IUCN. 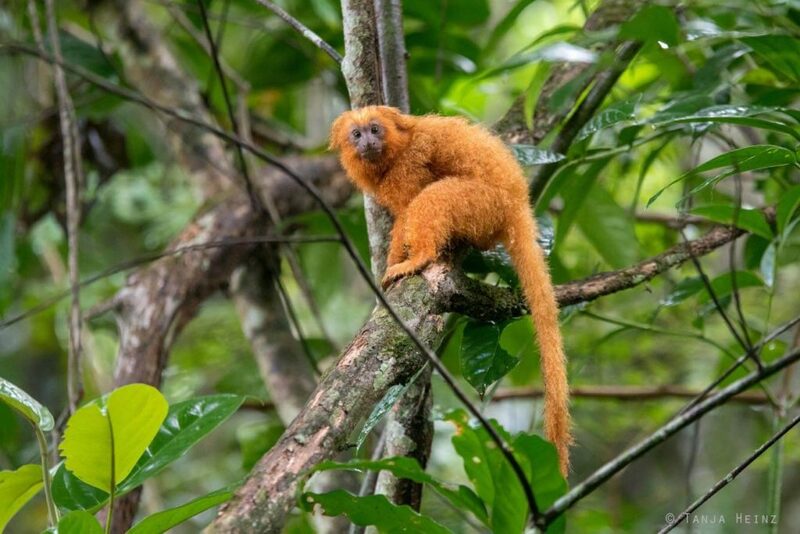 In 2000 golden lion tamarins were even listed in the category “critically endangered”. 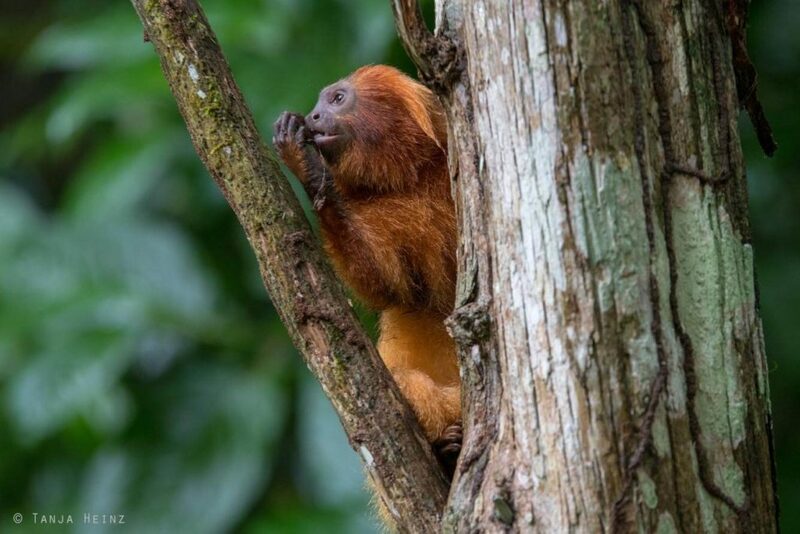 It is also important to mention here that one third of the wild golden lion tamarins in the Atlantic Forest can be traced back to captive bred animals. 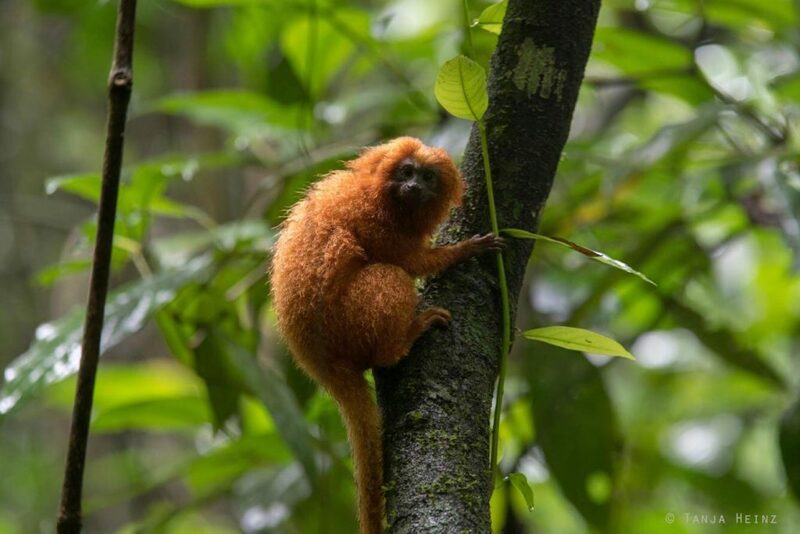 That means, establishing biological reserves, but also captive breeding contributed to the conservation of golden lion tamarins. 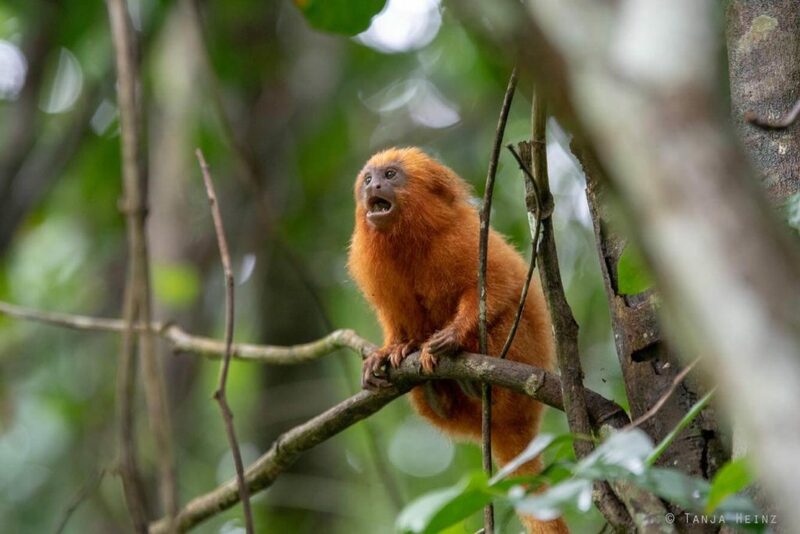 The Associação Mico-Leão-Dourado developed several strategies to continue with the conservation program of the golden lion tamarins. 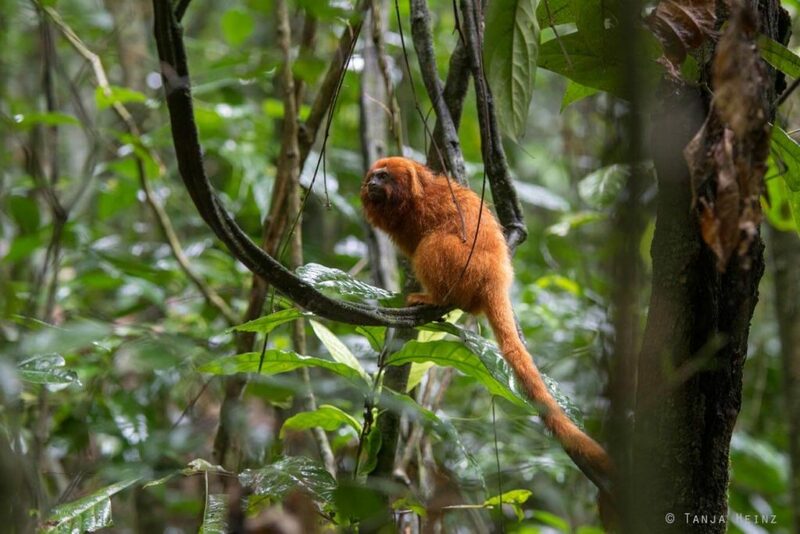 One of this strategy is monitoring the population of golden lion tamarins. That means staff of the Associação Mico-Leão-Dourado controls 18 groups of golden lion tamarions to find out where and how they live. 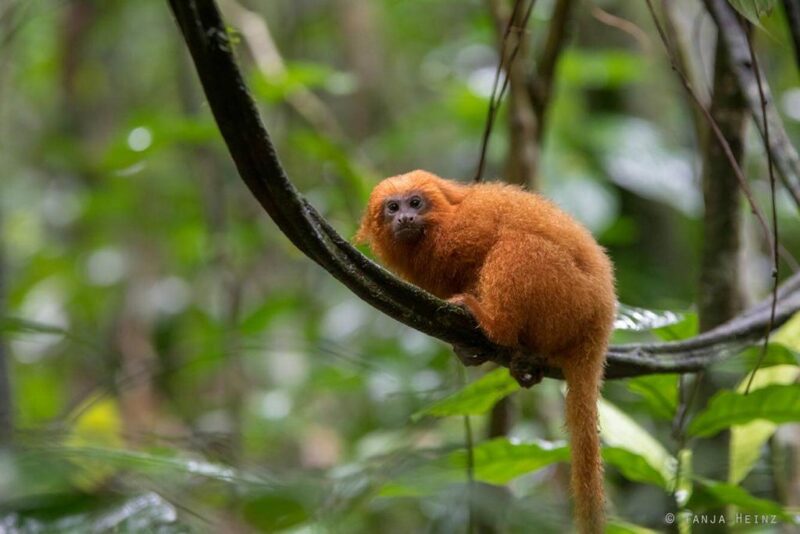 In order to do that they collect data about, for example, behavior, their positions or the environmental conditions on the day of their encounter with the golden lion tamarins. 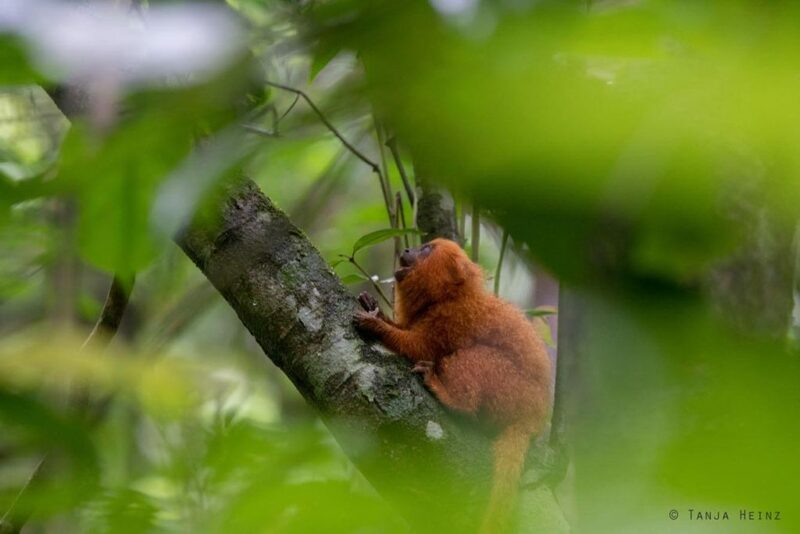 Monitoring of the golden lion tamarins is important because the population is still very small. 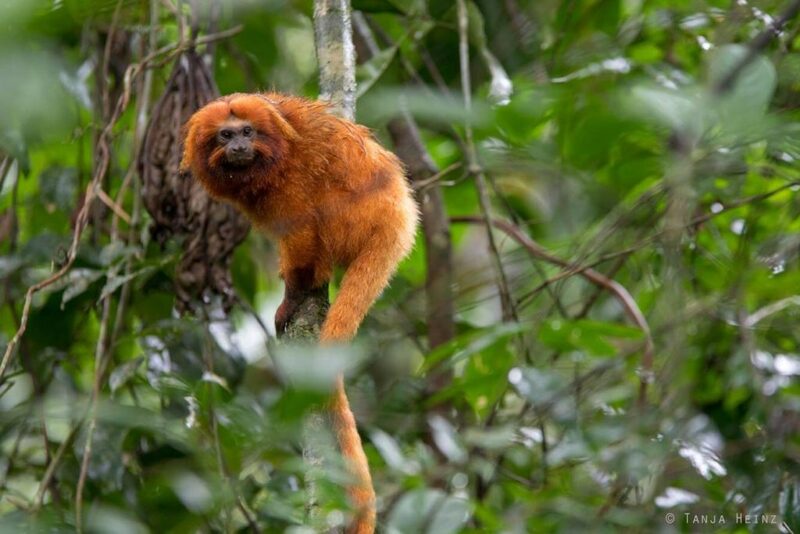 If it is necessary golden lion tamarins have to be translocated in order to avoid inbreeding. 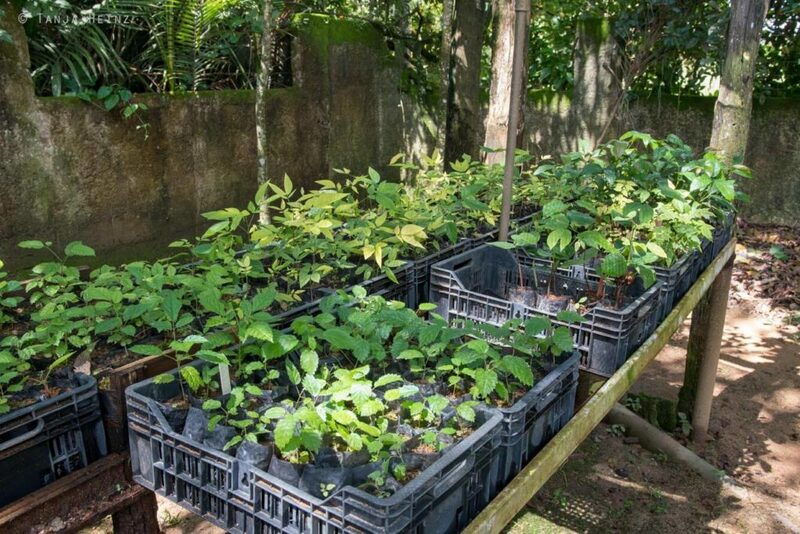 As the habitat of golden lion tamarins became smaller and smaller in the past, another strategy of the Associação Mico-Leão-Dourado is reforestation. 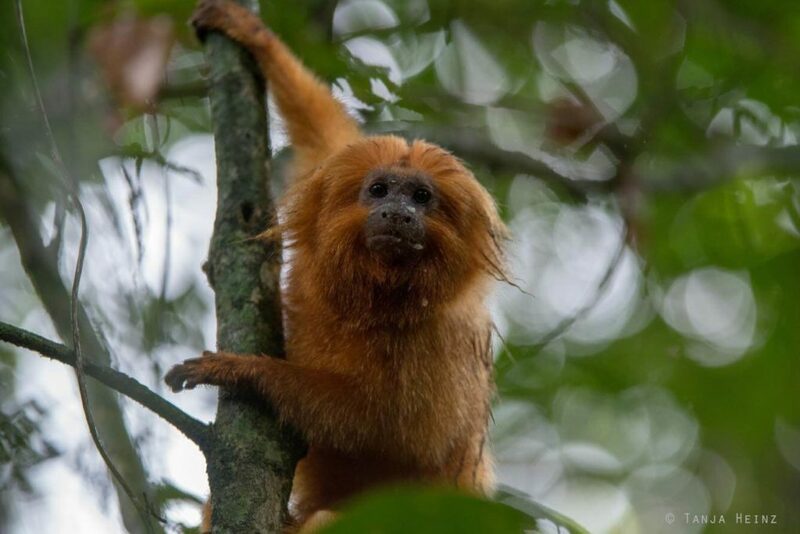 The aim is also to reconnect fragments of forests in order to guarantee that golden lion tamarins can interchange genetically again to avoid inbreeding. 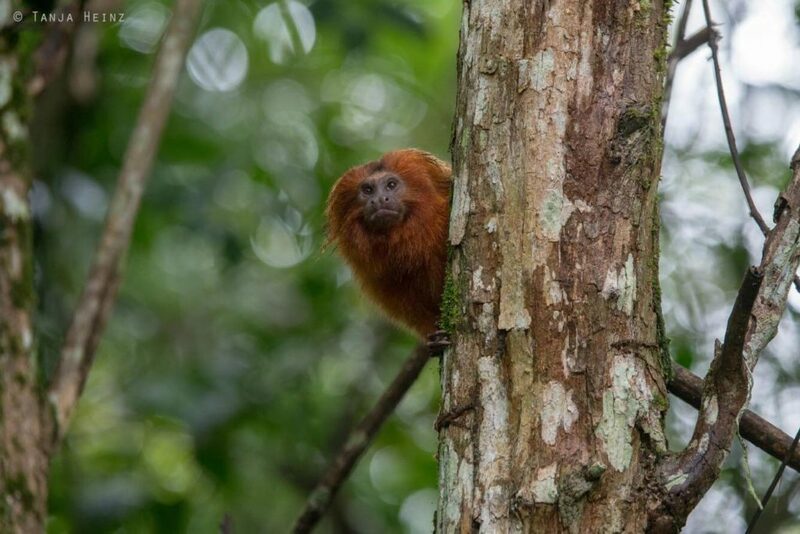 Furthermore, the Associação Mico-Leão-Dourado is trying to protect more forests and involving local farmers and families in the protection of the golden lion tamarins. 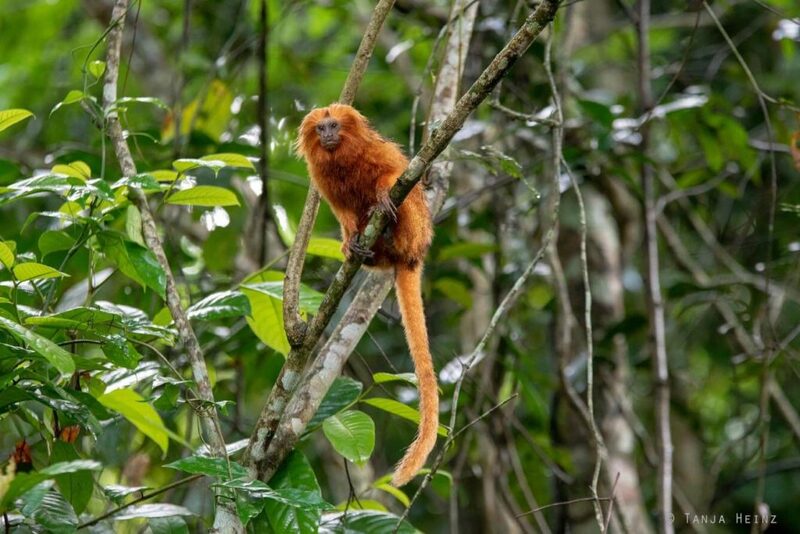 Education, marketing and a responsible tourism are further strategies of the Associação Mico-Leão-Dourado for an effective conservation of golden lion tamarins. 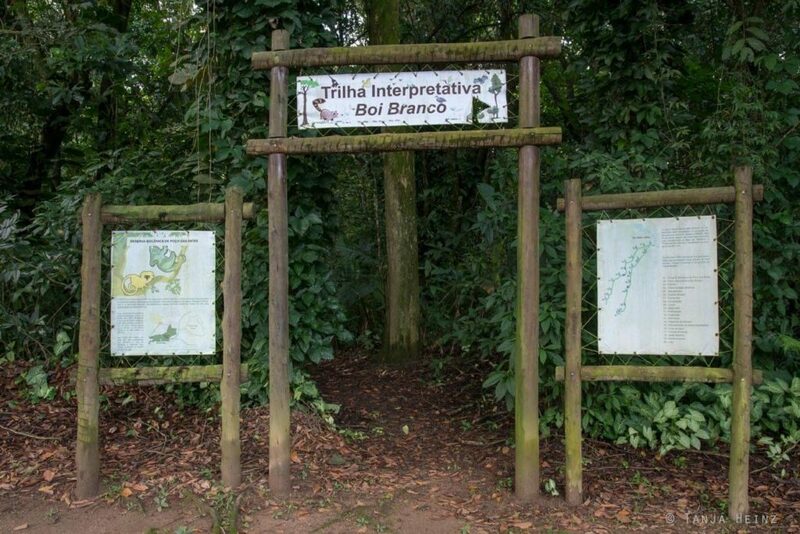 I visited the Associação Mico-Leão-Dourado in the Brazilian autumn in the Reserva Biológica de Poço das Antas. 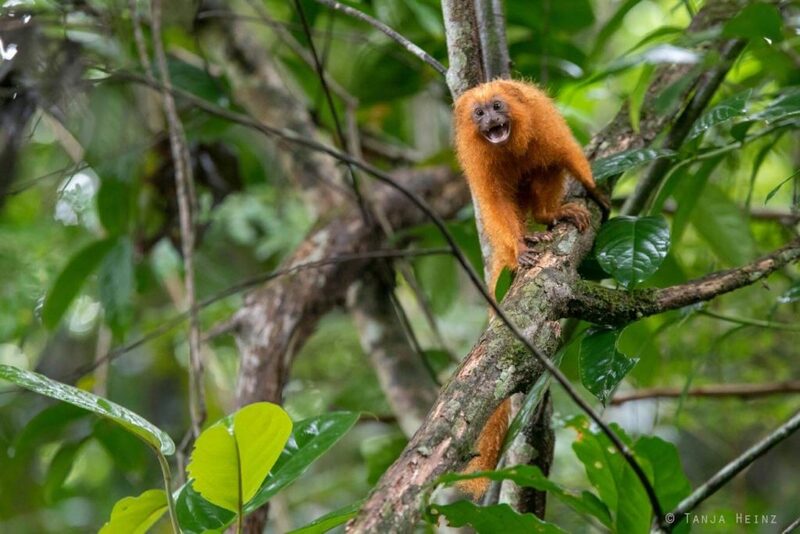 I was not only impressed by the golden lion tamarins I encountered there, but also by the people who are very committed to the conservation of the golden lion tamarins. 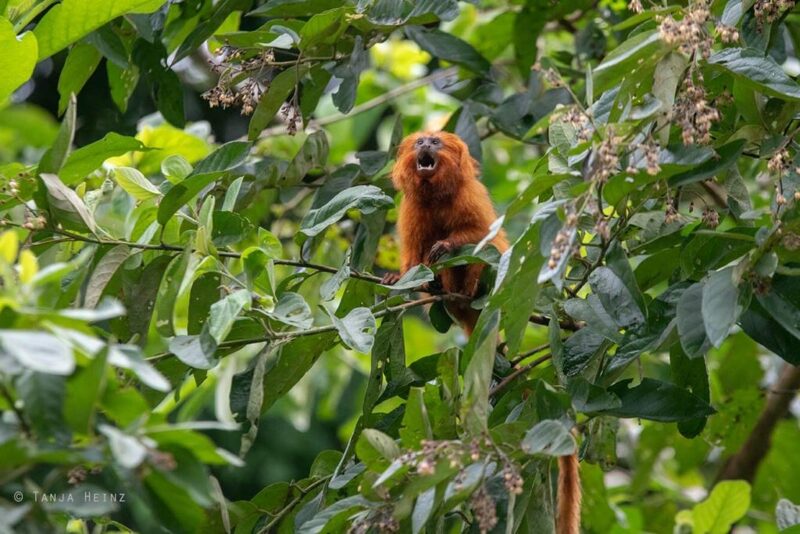 At the beginning of our first morning in Silva Jardim I was not sure if we really could go into the forest to observe the golden lion tamarins on that day. I was standing at the door of the breakfast area and I was continuously looking up the sky trying to find any light blue spot that would indicate a nice weather. I was looking for the blue spots in the sky in vain. The sun did not appear at all on that day. But fortunately, the rain stopped and the people of the Associação Mico-Leão-Dourado picked us up on that morning. 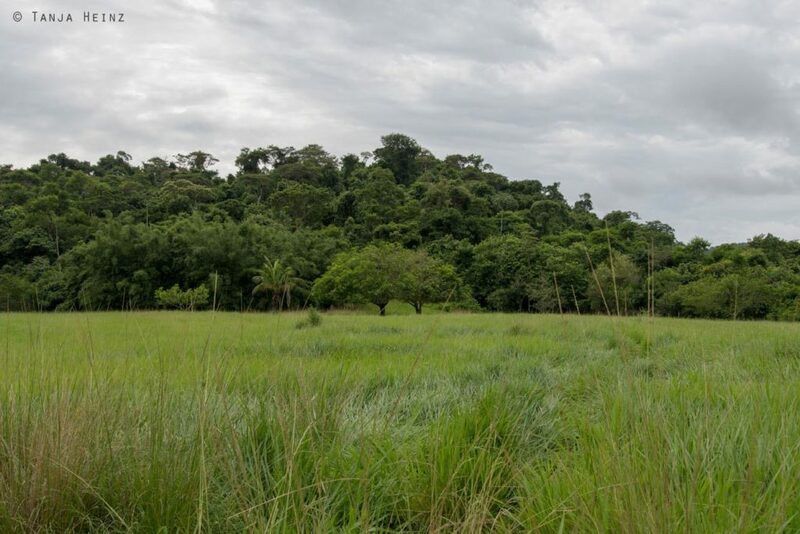 The Associação Mico-Leão-Dourado is located at the Rodovia BR 101 – Km 214 in the Reserva Biológica Poço das Antas in the municipality Silva Jardim. 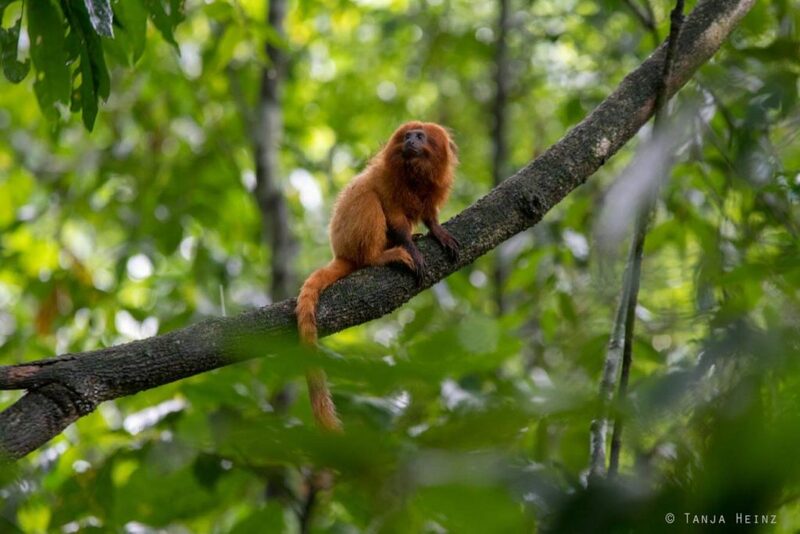 People of the Associação Mico-Leão-Dourado took us to a piece of forest where a group of golden lion tamarin lives. On our way to the golden lion tamarins the people of the Associação Mico-Leão-Dourado told us already a lot about the animals. 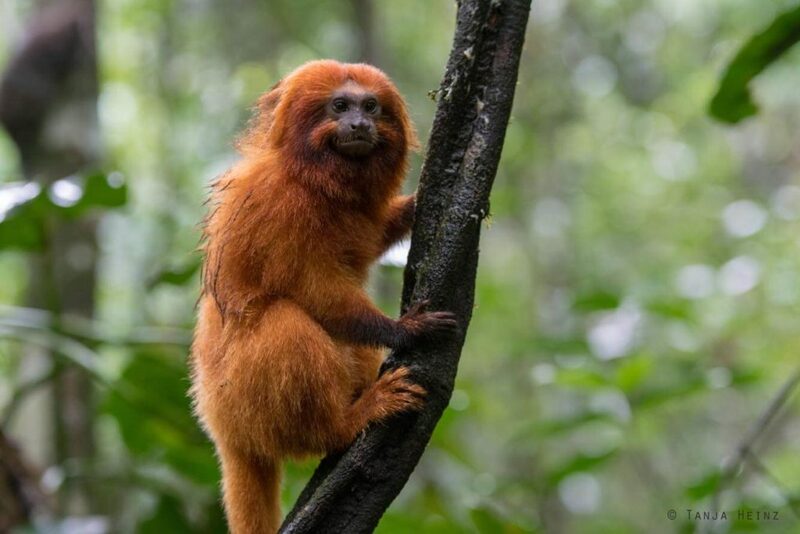 As they had worked for the golden lion tamarins for over twenty years, correspondingly, they have a broad knowledge about these unique animals. We stopped at a piece of forest. The meadow to the forest was still wet from the rain. When we arrived at the forest border we waited for some minutes. 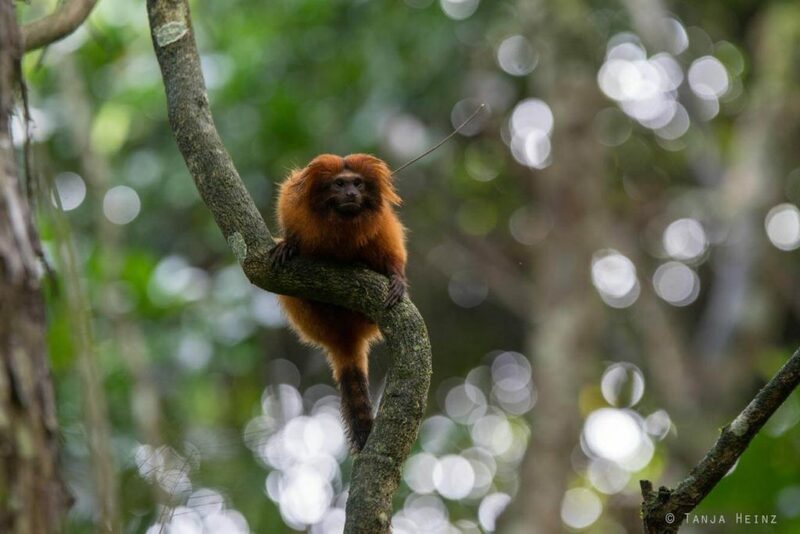 One member of the Associação Mico-Leão-Dourado was equipped with a telemetry antenna, because a few, but not all golden lion tamarins wear a transmitter around their necks in order to be found with the telemetry antenna. 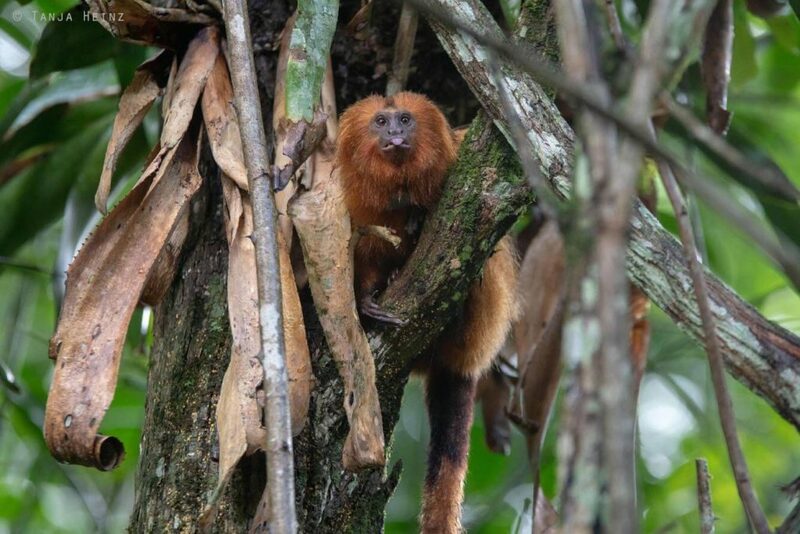 Immediately the people of the Associação Mico-Leão-Dourado knew where to look for the golden lion tamarins. 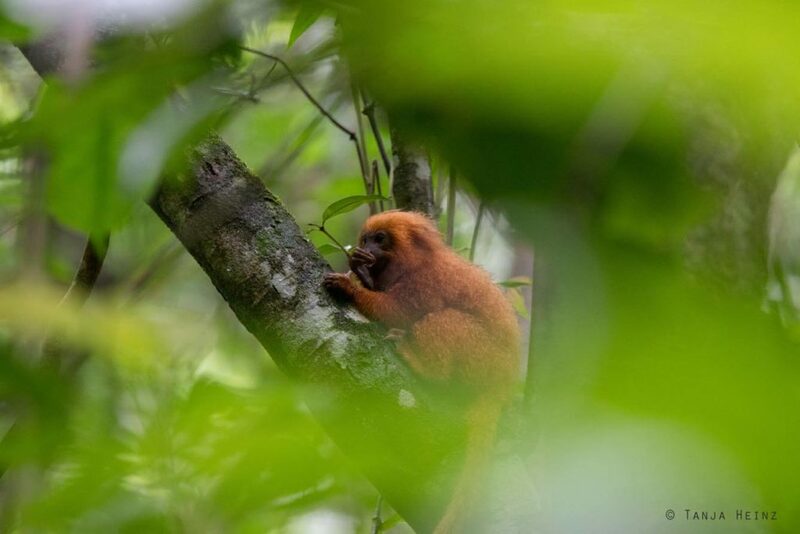 Within minutes we met a group of golden lion tamarins. 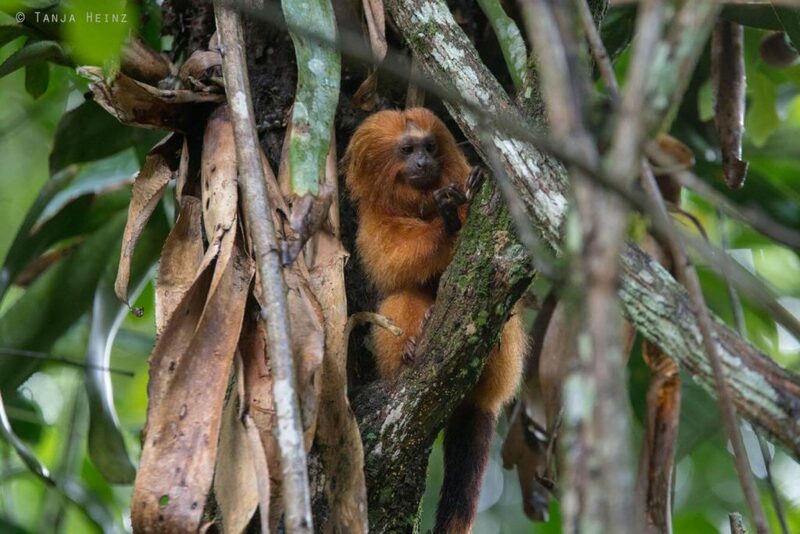 You couldn’t miss the golden lion tamarins despite the dense Atlantic Forest because of their calls. Furthermore, they could be easily recognized by their reddish orange pelage. But their face is hairless and without pelage. 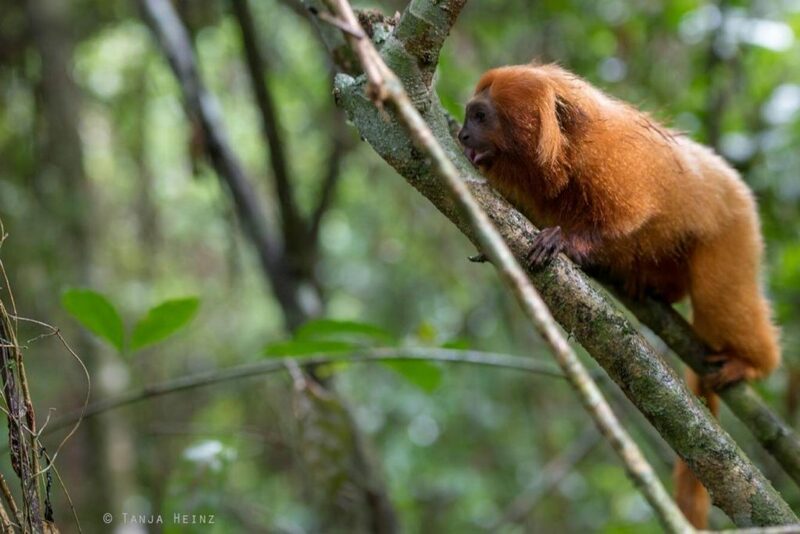 Of course we immediately spotted the golden lion tamarin with the transmitter. 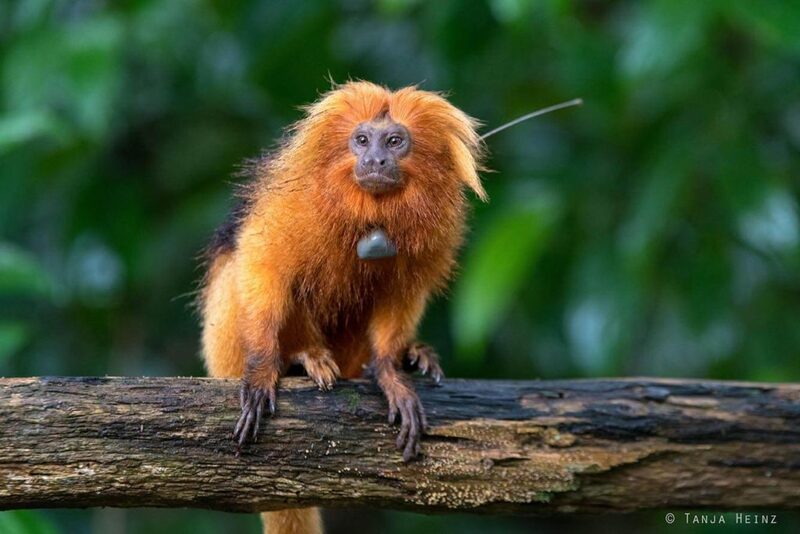 Some of the animals – including the golden lion tamarin with the transmitter – were marked with a black color in order to differentiate groups from each other. 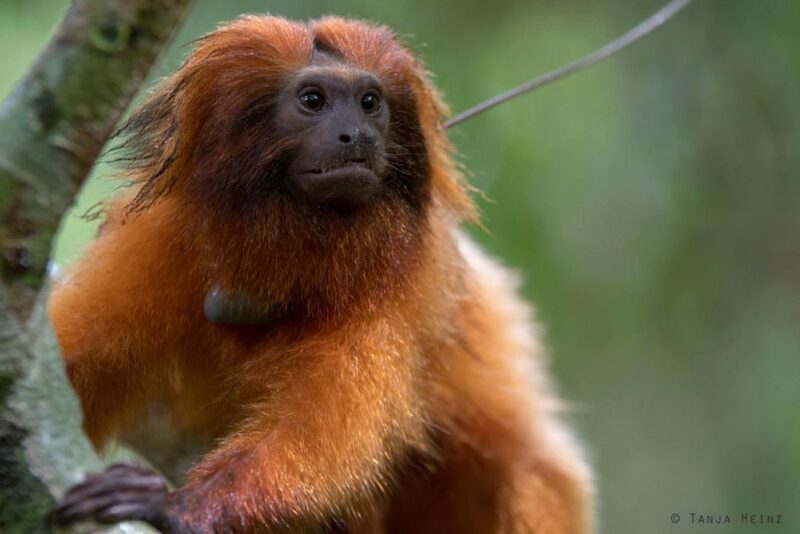 The golden lion tamarin with the transmitter was marked with a black color at the tail. 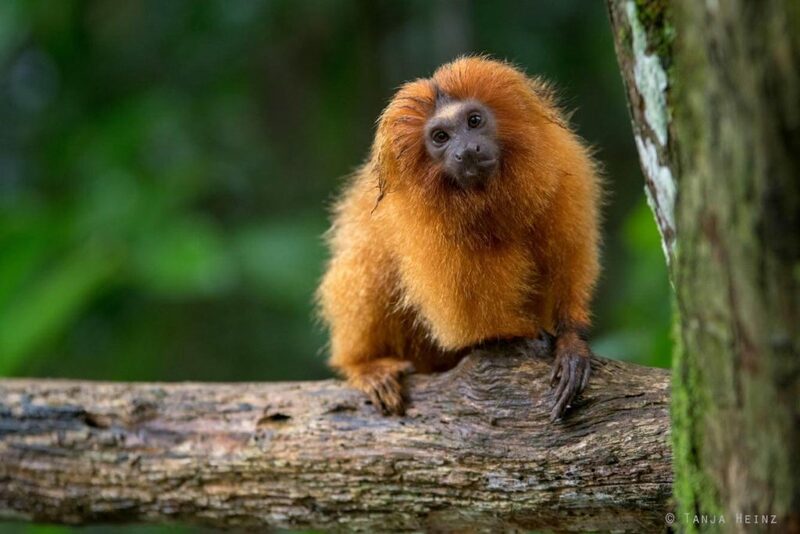 By the way, golden lion tamarins are like Geoffroy’s marmosets (Callithrix geoffroyi) and common marmosets (Callithrix jacchus) of the family Callitrichidae. 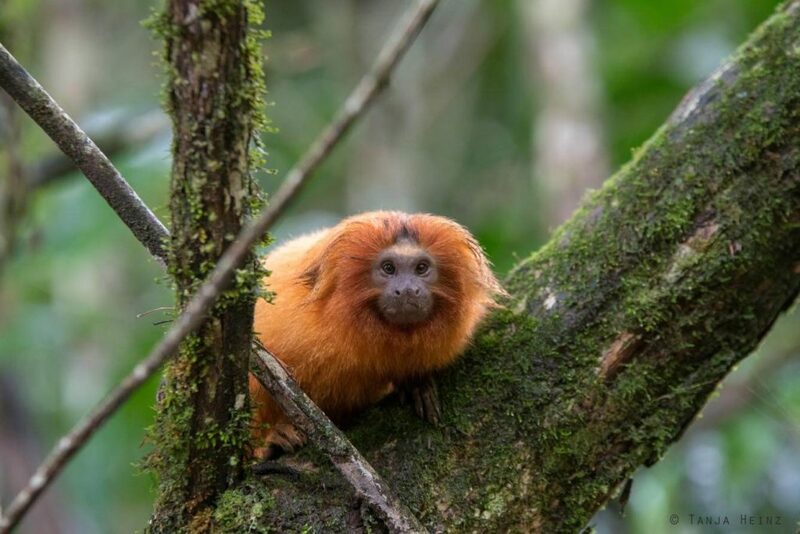 If you know my article about common marmosets at the Sugarloaf Mountain in Rio de Janeiro then you know that lion tamarins (Leontopithecus) also belong to the family Callitrichidae. There is one important characteristic of the family Callitrichidae. 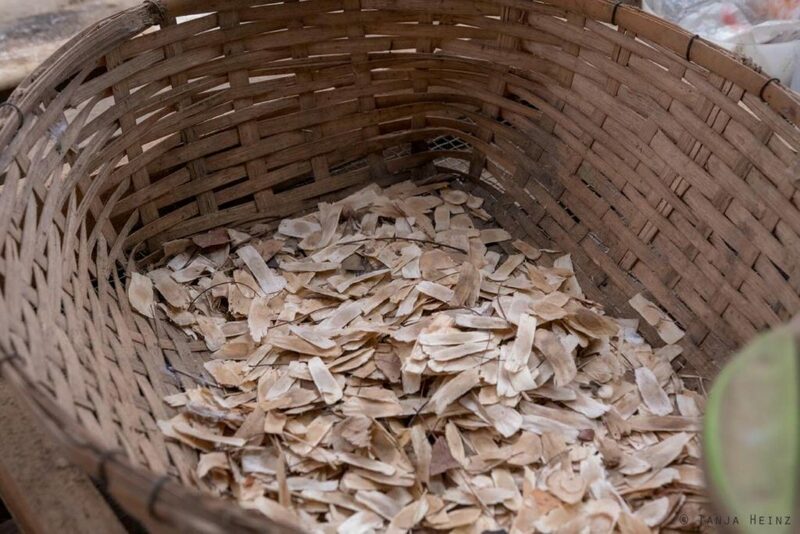 Members of this family have claws instead of nails at their fingers and toes (except the big toe). 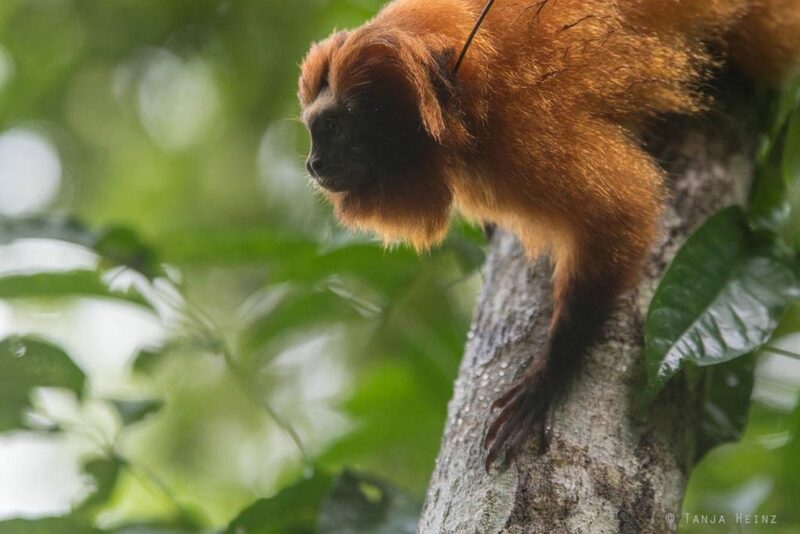 As a result golden lion tamarins are like all other members of the family Callitrichidae able to climb up and down vertical tree trunks. They are able to clutch at tree trunks and they do not slide down. Even young animals are already true climbing artists. 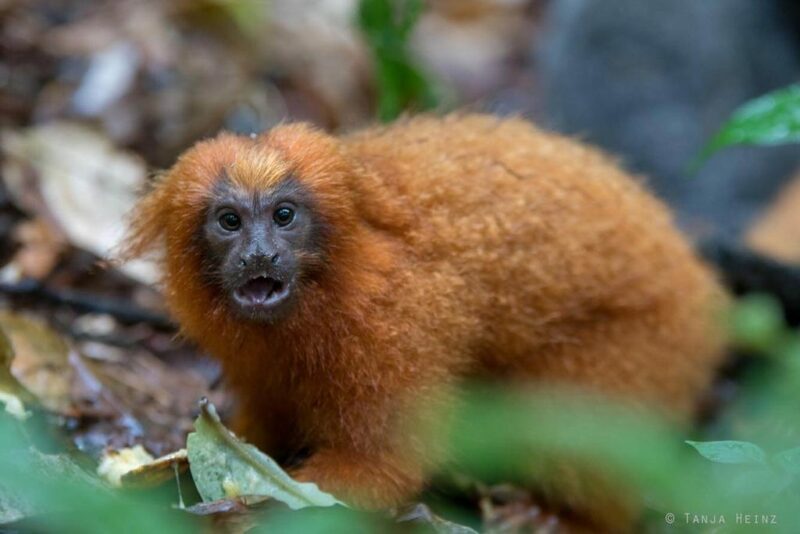 By the way, there are four species of lion tamarins. 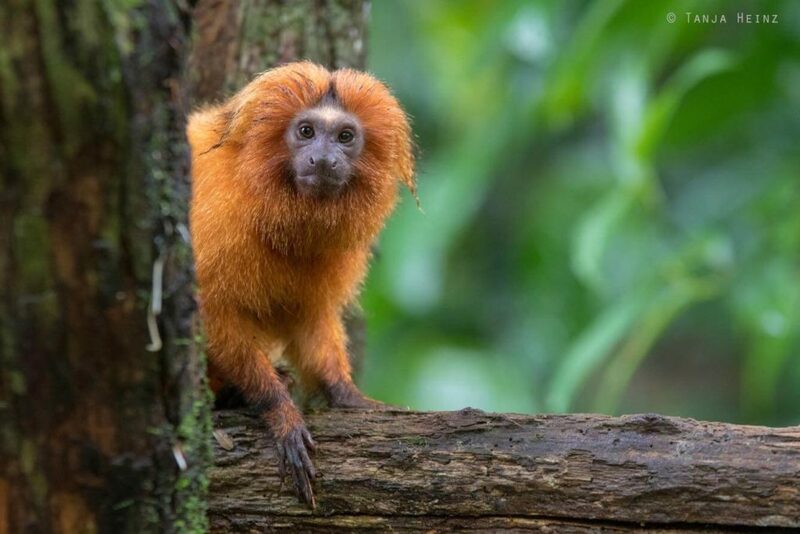 In addition to golden lion tamarins there are golden-headed tamarins (Leontopithecus chrysomelas), black lion tamarins (Leontopithecus chrysopygus) and black-faced lion tamarins (Leontopithecus caissara). 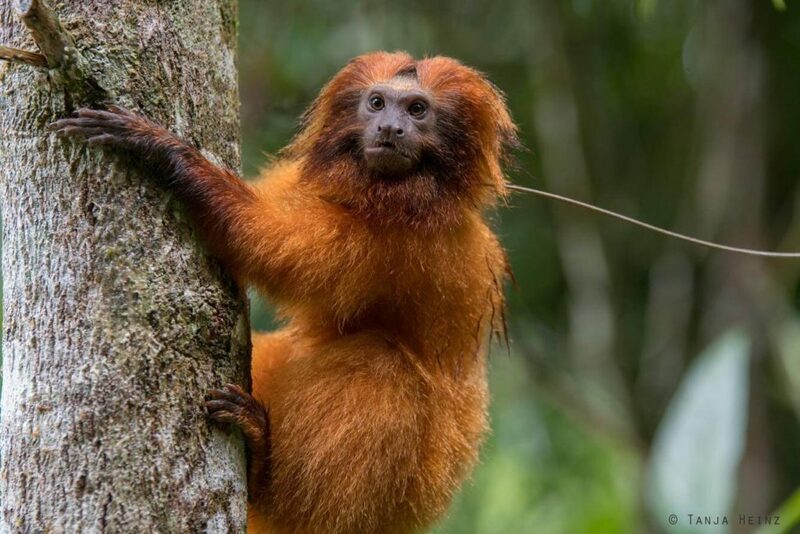 Golden-headed tamarins and black lion tamarins are like golden lion tamarins “endangered” accourding to the World Conservation Union IUCN. 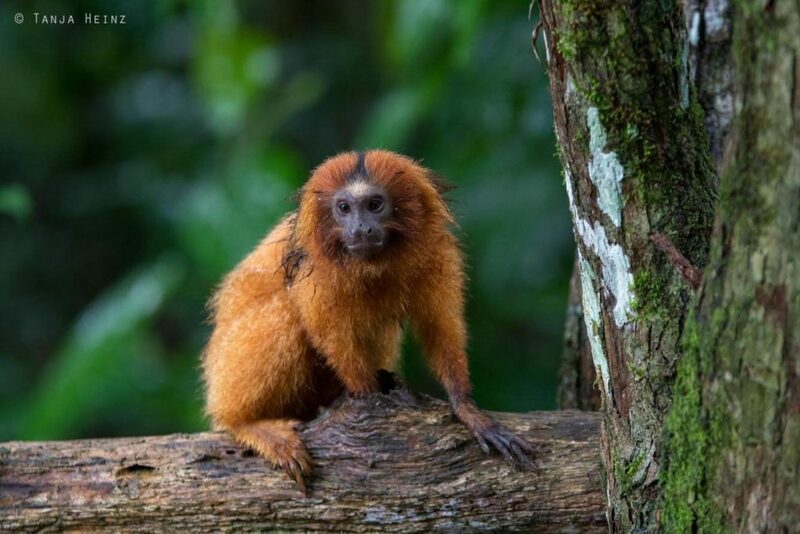 However, black-faced lion tamarins are even “critically endangered”. 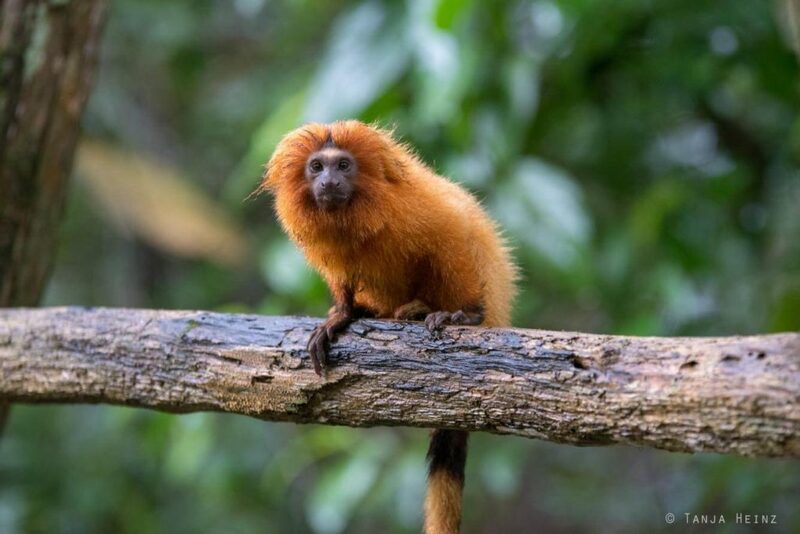 While golden-headed tamarins live further North when compared to the golden-lion tamarins, that means in the state Bahia, the two other lion tamarins live further South. Black lion tamarins live in São Paulo and black-face lion tamarins in forests shared by São Paulo and Paraná. 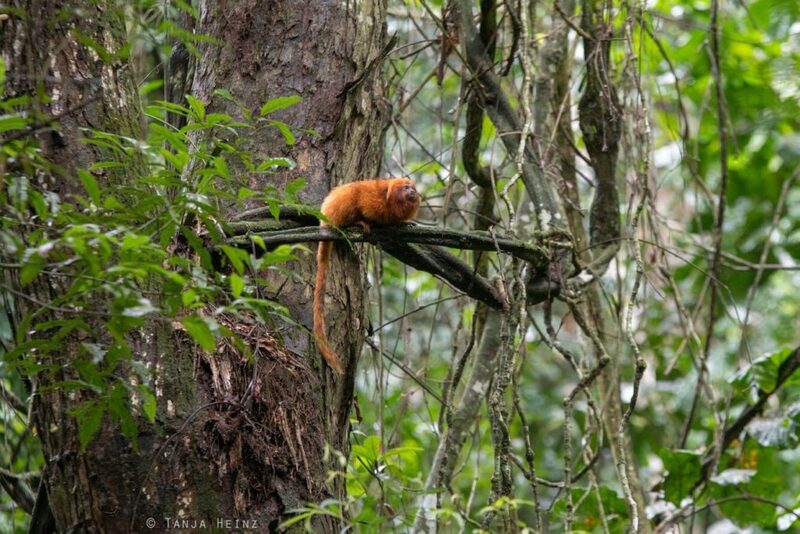 As mentioned above we could not miss the golden lion tamarins when we entered the forest because of their noise. When we entered the forest we observed a confrontation. There was one single females roaming alone in the forest and entering the territory of a family. 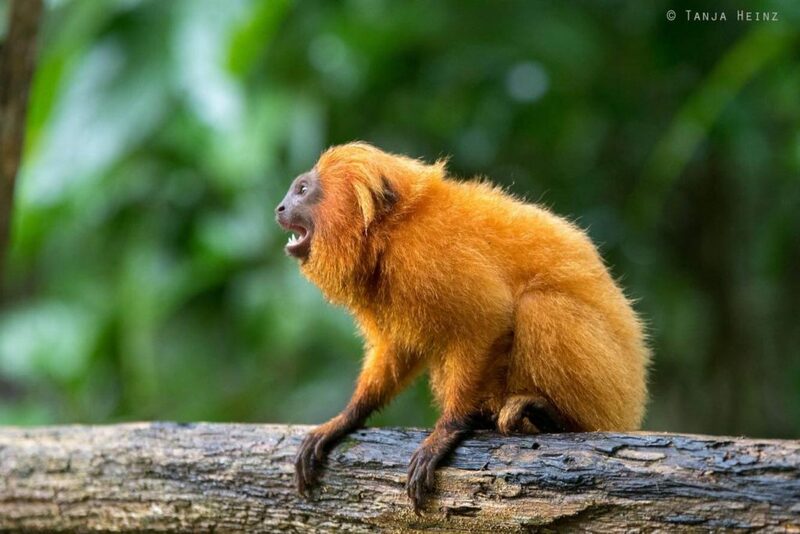 Golden lion tamarins are territorial animals and live in families. 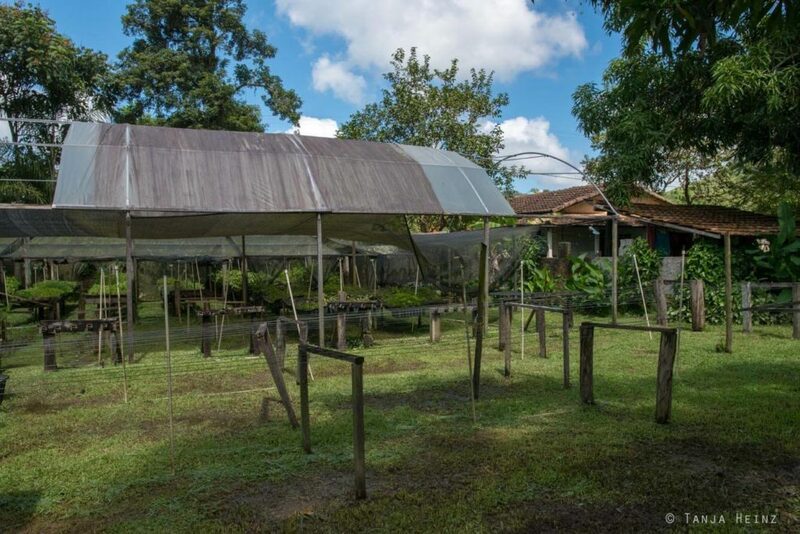 One family lives in a territory of about 50 hectares which they will defend against intruders. Again and again she started to call. Then she was looking into the direction of the group. 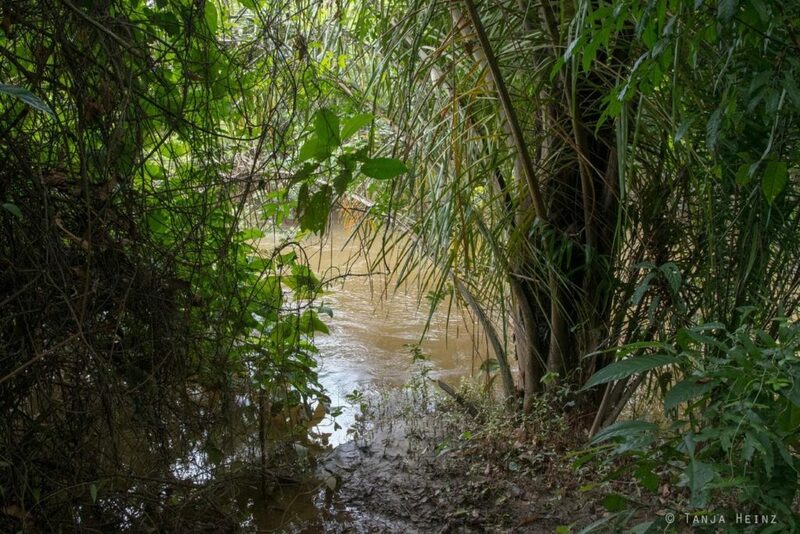 When she disappeared again we did not see here again during our stay in the Atlantic Forest. 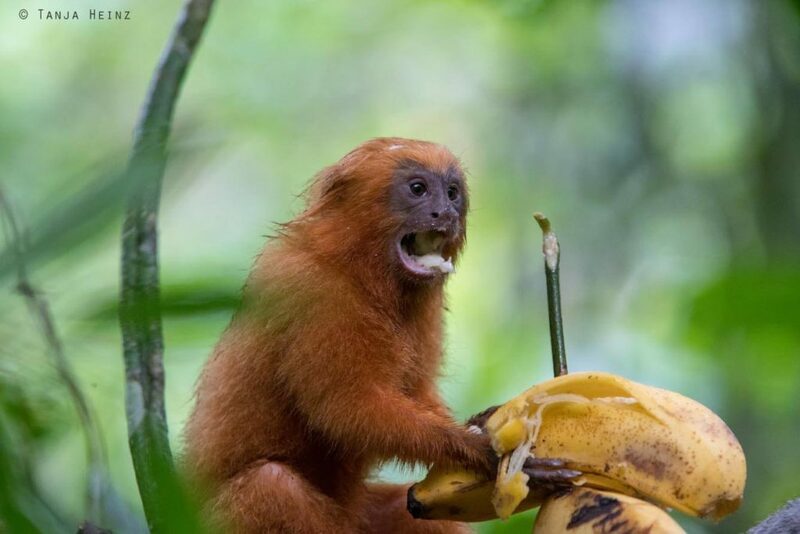 Social bonds between golden lion tamarins are very complex. One family comprises on average seven animals whereby only one pair wihtin the family – the alpha-female and the alpha-male – reproduces within the family. Typically, members of the family Callitrichidae give birth to twins and all members of a family help rearing the offspring. However, only mothers carry their young after birth. Only in the second week the father might carry the young as well. Siblings start helping only in the third week. 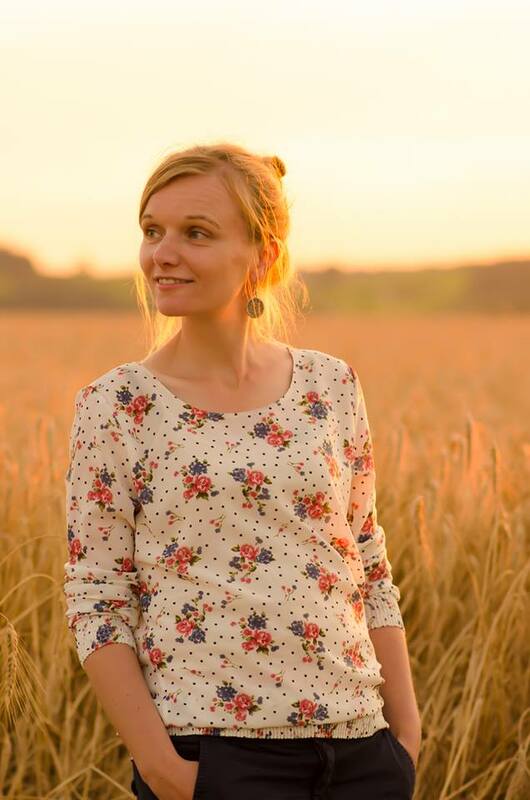 By the way, it might be possible to hear it when a female is pregnant. Calls of young and females actually differ. But when females are pregnant they sometimes call like a young. However, members of a family do not only help rearing the offspring, but also share tasks between each other in general. For example the task of a sentinel. The task of a sentinel is to look out for possible dangers while the others are foraging. 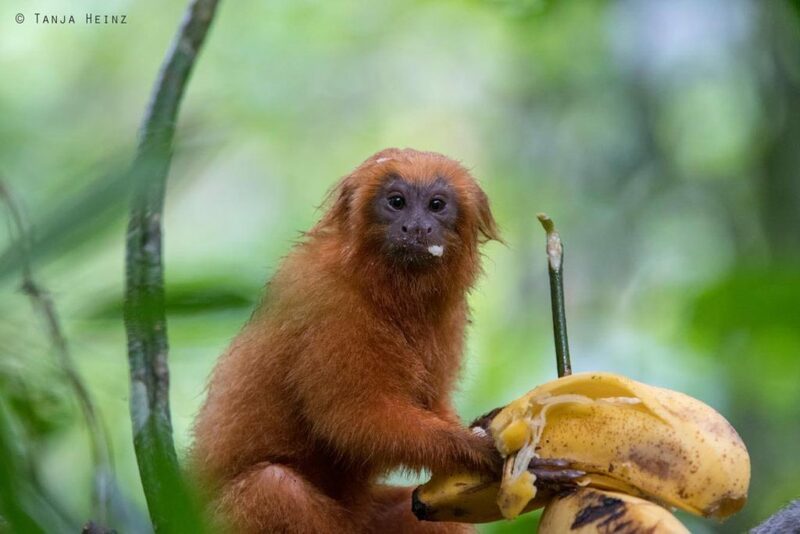 Golden lion tamarins feed on fruits, insects and other little invertebrates, but also frogs and reptiles. We spotted one of their favourite food on the ground. But on that day we saw them especially feeding on leaves. Or gnawing and chewing on branches. Sometimes they were lapping up branches and smelled at them. Even young animals showed this behavior. Sometimes I could not realy see what they were doing. Maybe searching for food? Yes? Or no? In other moments they look as if they would search for something special within a tree trunk. 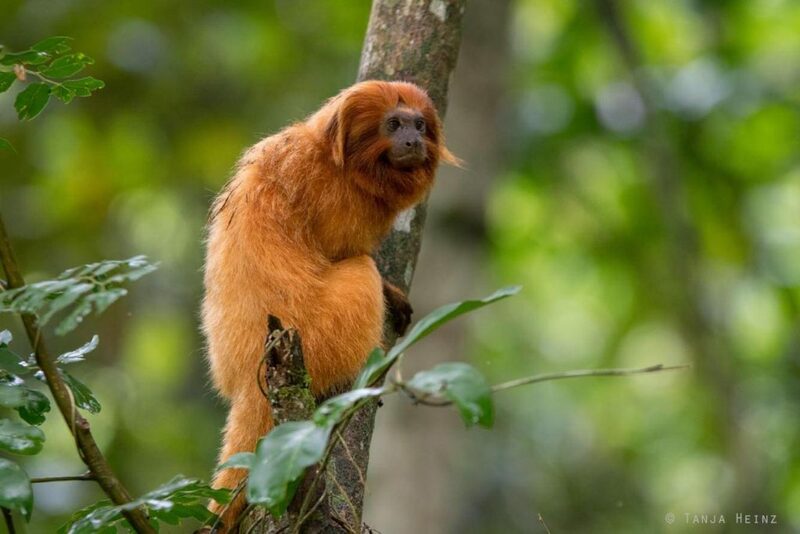 By the way, golden lion tamarins are arboreal and usually do not come to the ground. But sometimes they do. Maybe to look for food? 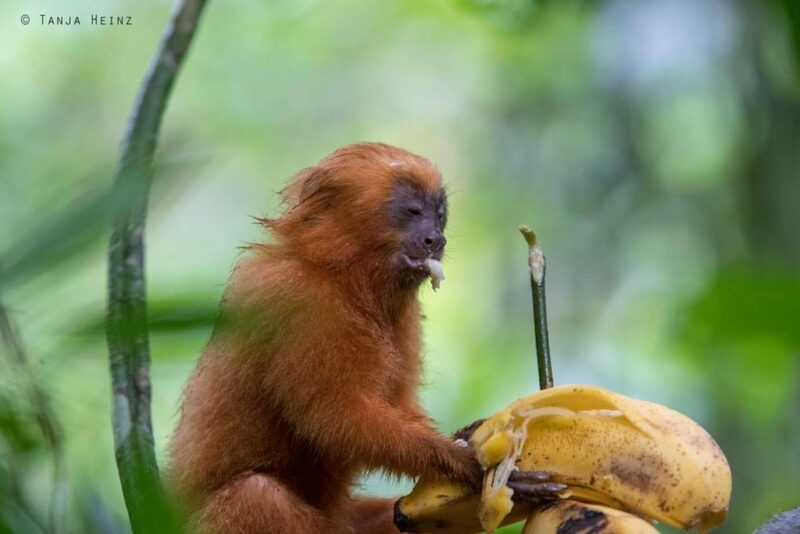 The members of the Associação Mico-Leão-Dourado brought some bananas for the golden lion tamarins. You could guess who was already at the banana. The smaller animals were allowed as well to enjoy this extra food. But finally they also had to give place to other animals again. Their food preferences influences where they live. Preferably they live under 500 meters, as frogs – one of their favourite food – live at rivers. However, when they have to move, for example when agriculture extends, they would live up to 700 meters. Nevertheless, wheather or not living under 500 or 700 meters, by all means the position of a sentinel is to look out for dangers while the orthers are foraging. The distribution of tasks is very important within a family. 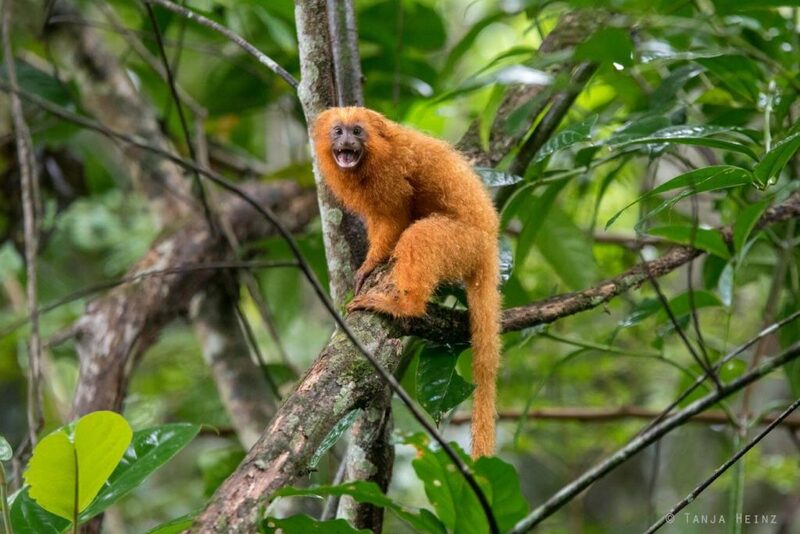 By the way, there are two reasons why golden lion tamarins might expel a member of a family. In one situation they might expel an animal when the expelled individual does not take over a task. The other situation is when it’s time for a member to found its own family. 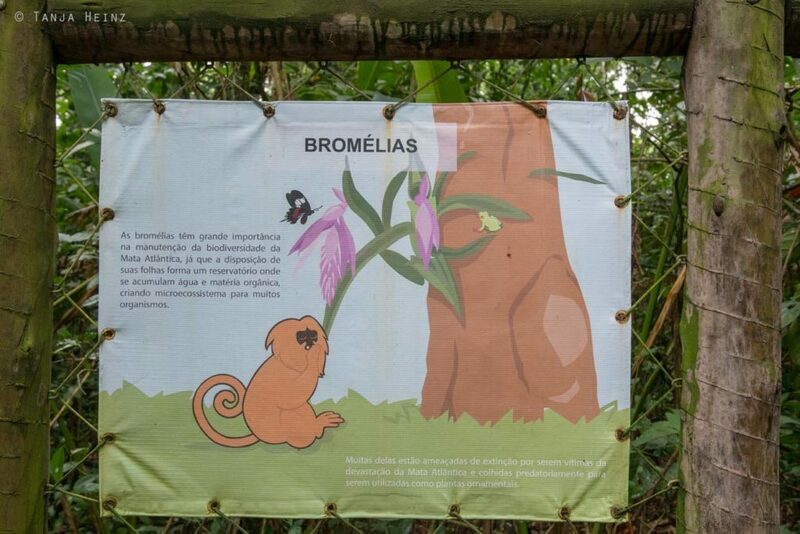 By the way, we met another member of the family Callitrichidae in the forests of the golden lion tamarins. And that was the common marmoset. 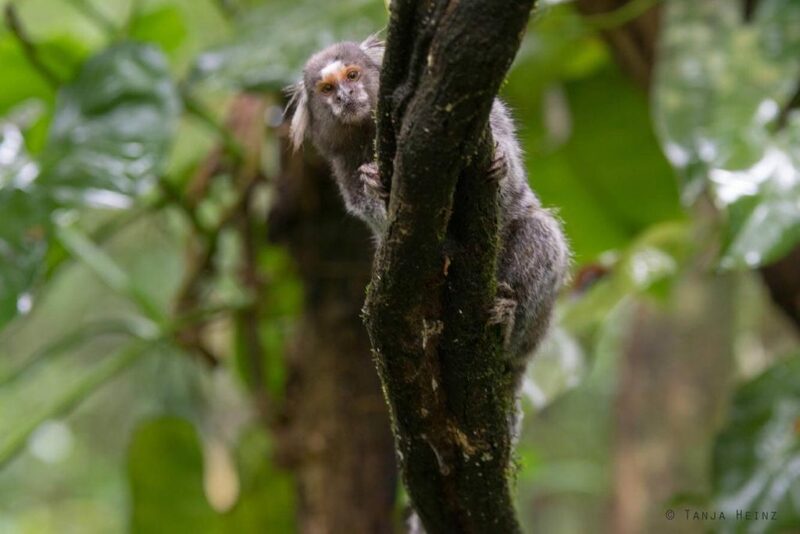 If you know my article about the common marmosets at the Sugarloaf Mountain then you know already that common marmosets do not naturally occur in the forests of Rio de Janeiro. 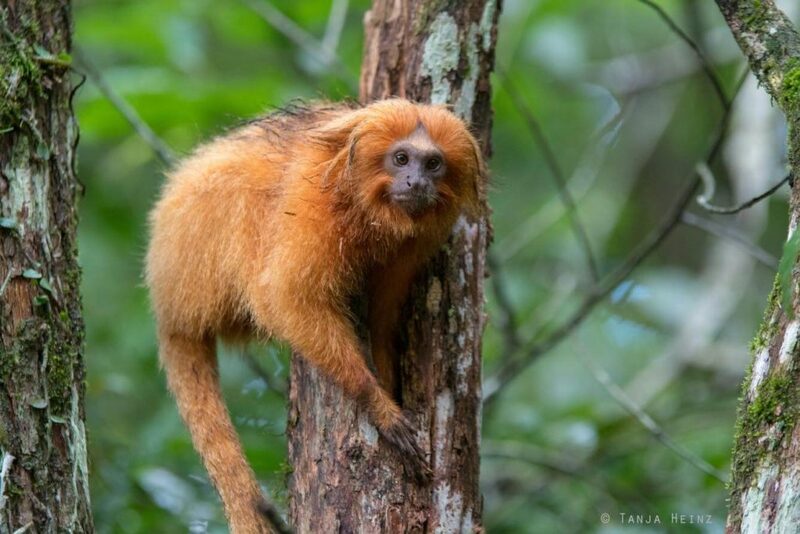 This does not really contribute to the conservation of the golden lion tamarin as common marmosets compete with golden lion tamarins for food because they eat the same. 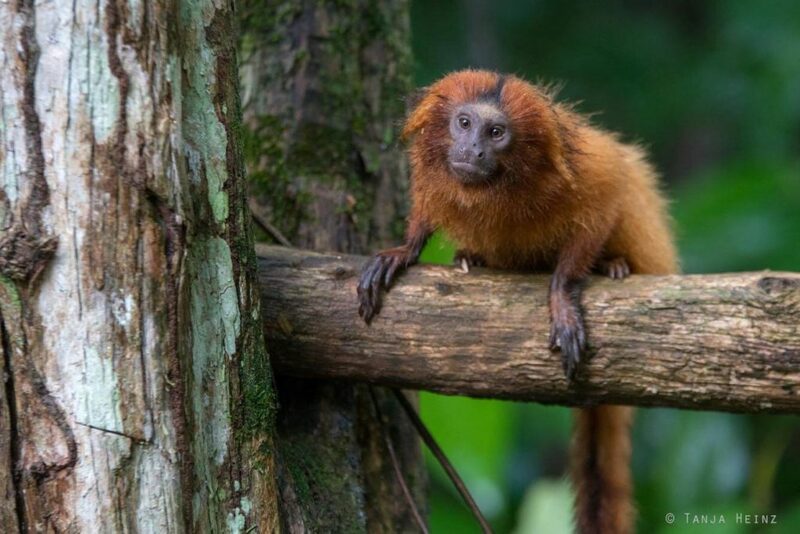 There are more monkeys, that means capuchin monkeys, that influence the conservation of golden lion tamarins. These monkeys destroy young juçara palms (Euterpe edulis), and thus, fruits of this palm will not grow. But golden lion tamarins feed on these fruits of this palm. 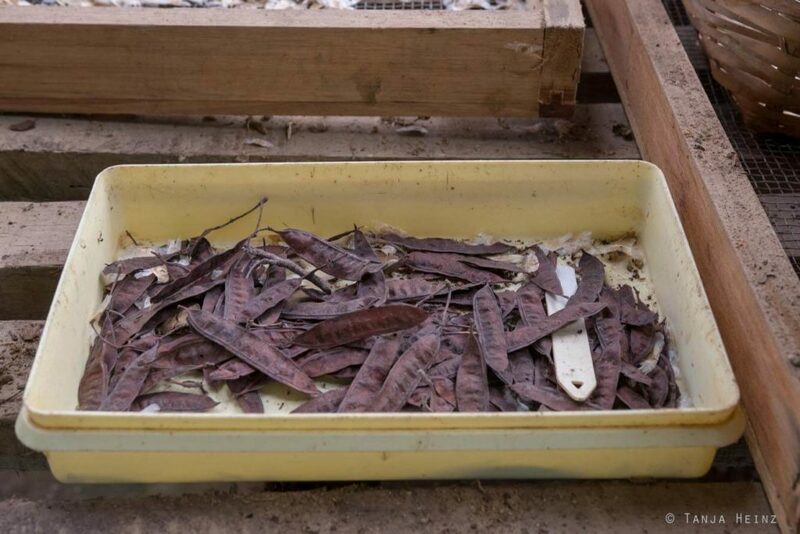 By the way, the juçara palm is endangered as it is also used for consumption. 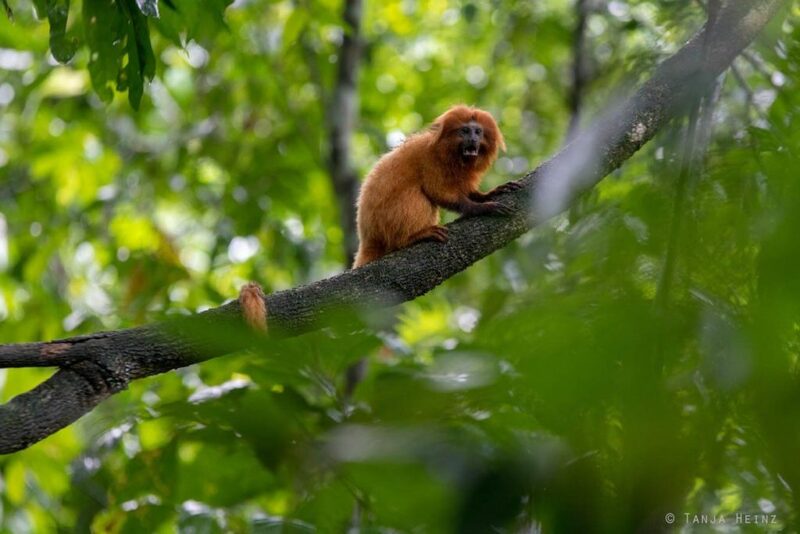 We had the chance to meet the golden lion tamarins by the Associação Mico-Leão-Dourado on two days. On both days we could not observe the golden lion tamarins feeding on these palms. 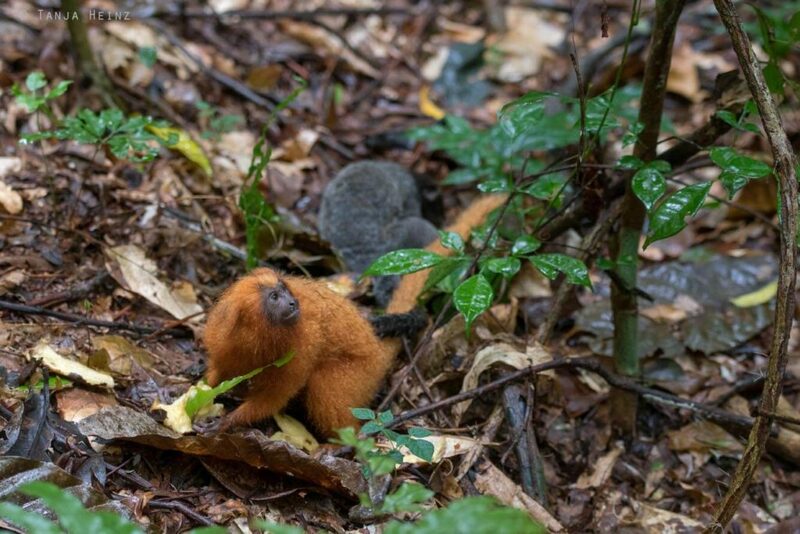 However, on our second day we met another group of golden lion tamarins. Correspondingly, the golden lion tamarins had their marking at another side on their pelage. Of course we saw again a golden lion tamarin with a transmitter. 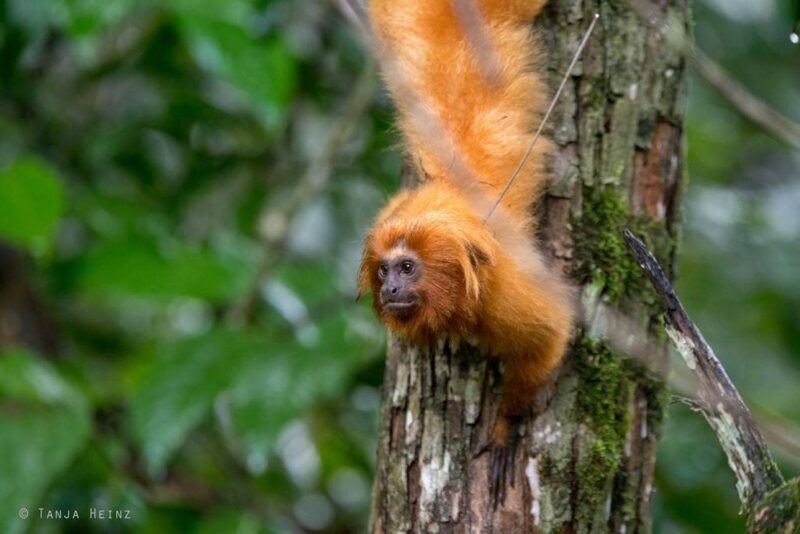 On the second day the weather was much sunnier and we could observe the golden lion tamarins from close up as they were moving on a vertically postioned tree branch. 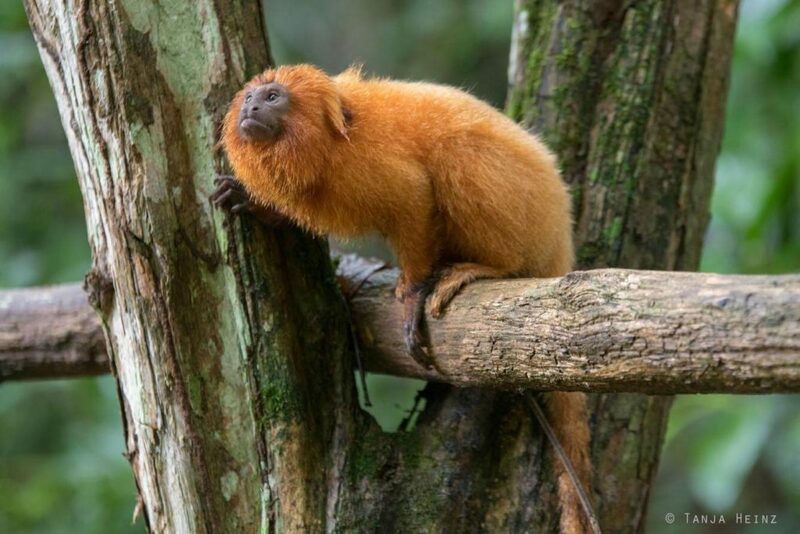 On this branch the golden lion tamarins apparently were looking for something to feed on. While one of the golden lion tamarins was busy with a small tree hole on that branch, another golden lion tamarin apparently was waiting for its turn. Finally it was its turn. As they were so close it was easier for me to observe them. Sometimes they were just sitting on the tree branch. And sometimes they started to call. Sometimes they were looking into my direction. 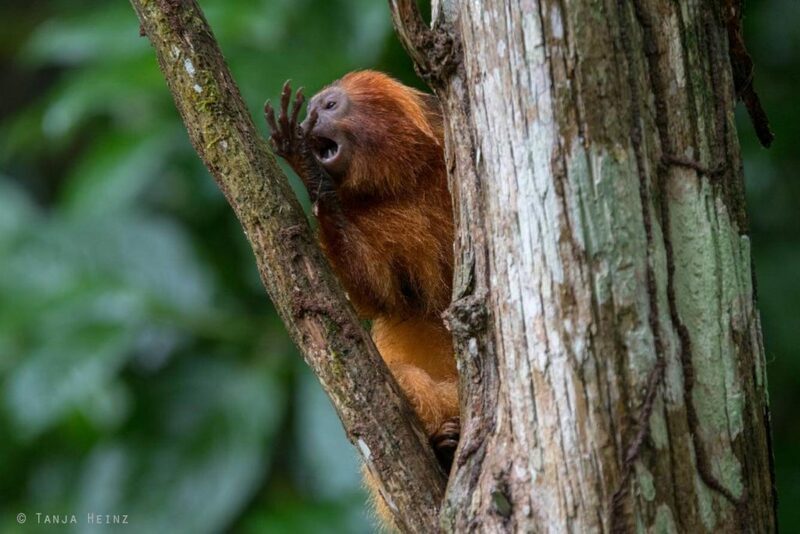 On our second day I could observe golden lion tamarins smelling at their hands again. Others were sitting on branches in the dense Atlantic Forest. Another one was climbing eagerly. While another one was posing as if it would think. Sometimes they just suddenly appeared behind a tree. 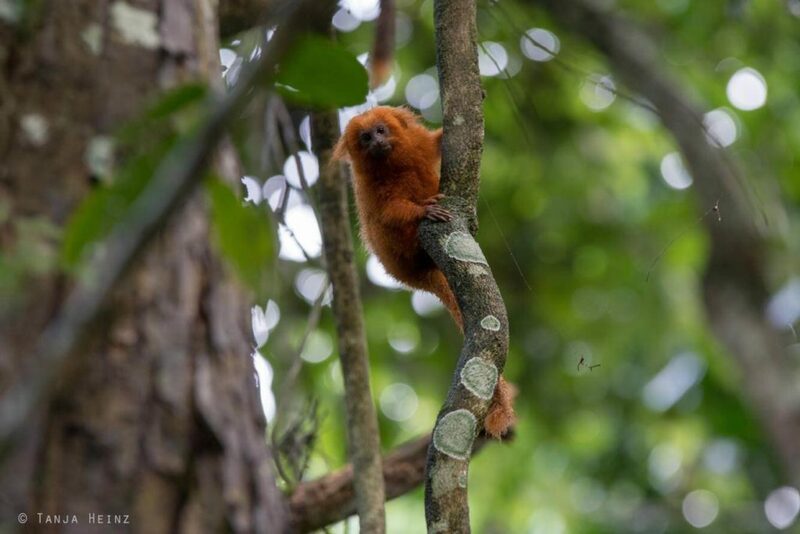 Even young golden lion tamarins showed up on that day. In one moment it started to call. Then it changed its position and called again. 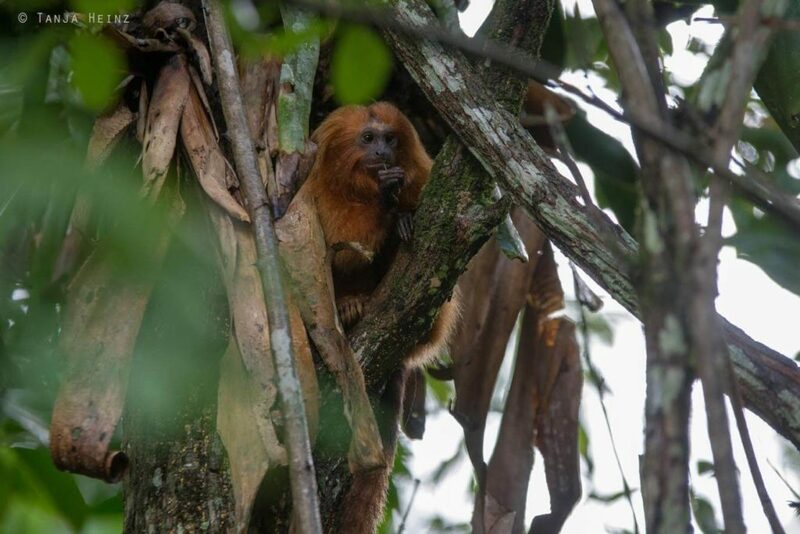 But even adult golden lion tamarins were calling again and again through the Atlantic Forest. 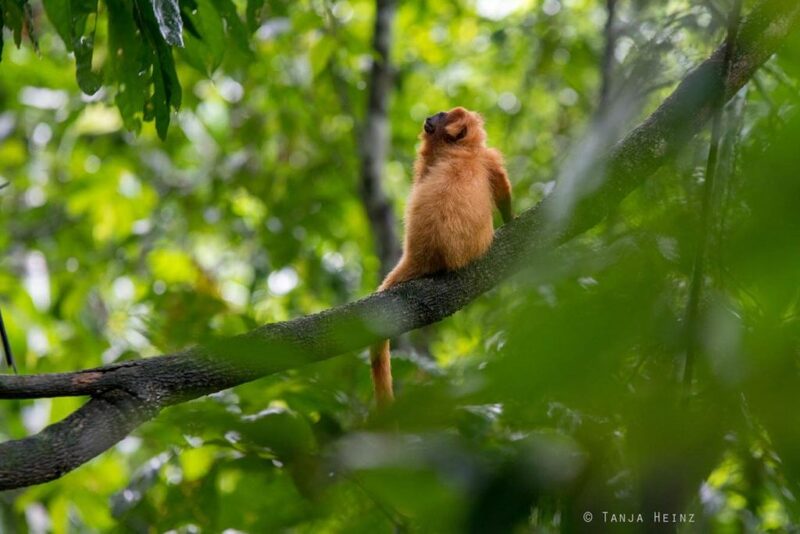 I could have observed the golden lion tamarins for many more hours, but at one point it was time for us to go. 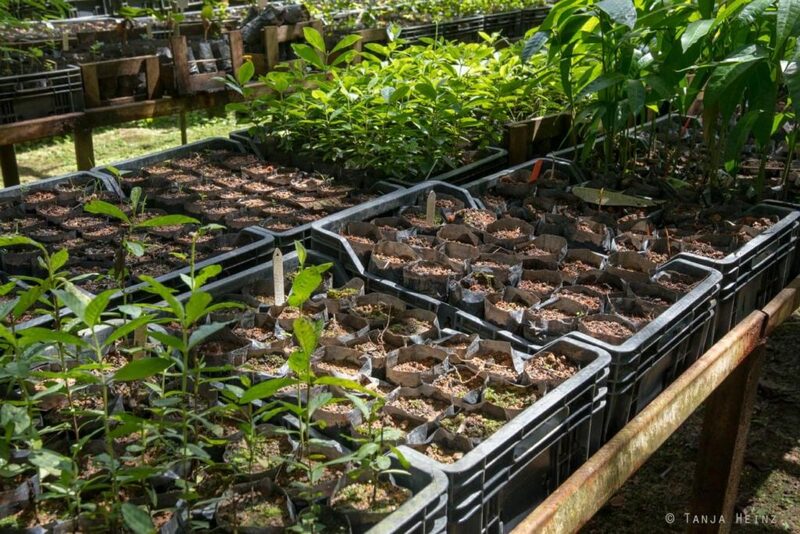 Furthermore, we were interested to see more about the work of the Associação Mico-Leão-Dourado like the reforestation and the nursery. 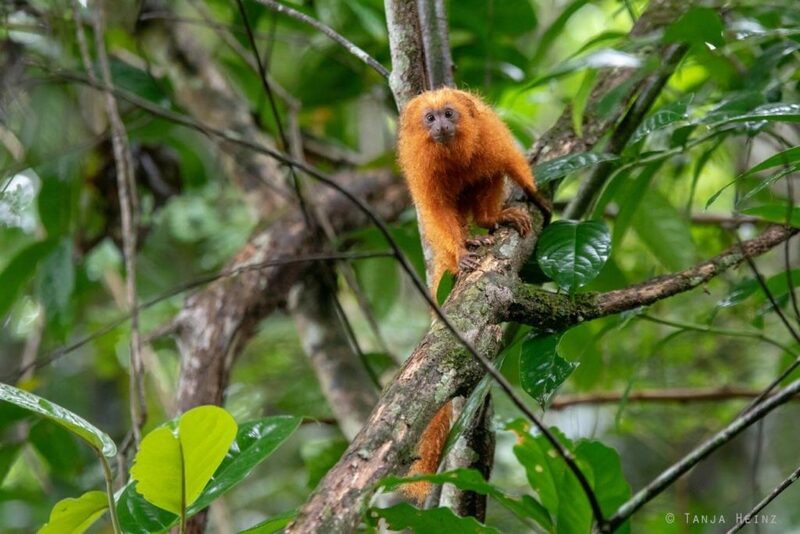 One important point for the conservation of golden lion tamarins is – like mentioned above – the reforestation of Atlantic Forest. 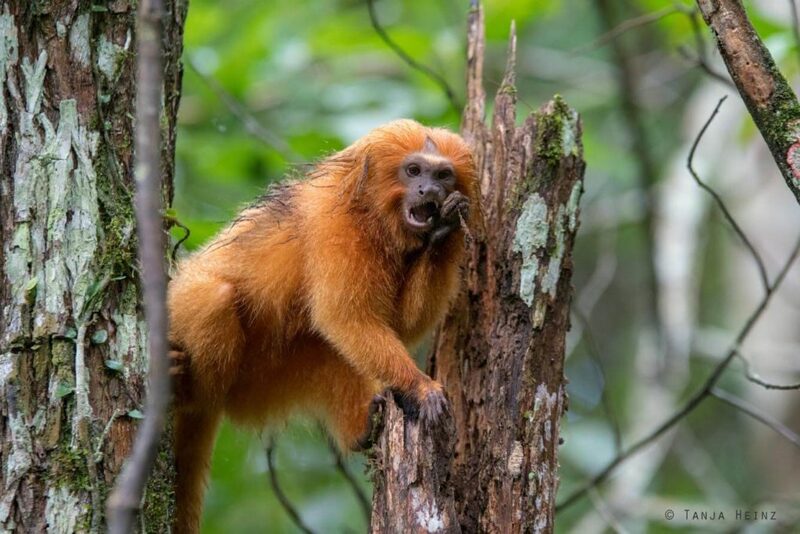 In this way the Associação Mico-Leão-Dourado creates new habitat for the little primates, but also reconnects habitat fragments with each other. It is also planned to build corridors across streets so that animals can cross busy roads. 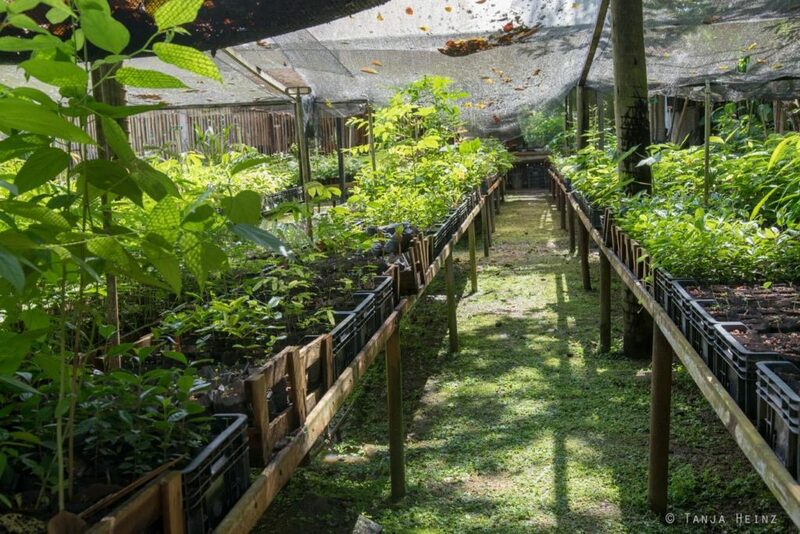 We visited one place where the Associação Mico-Leão-Dourado participates in reforestation. 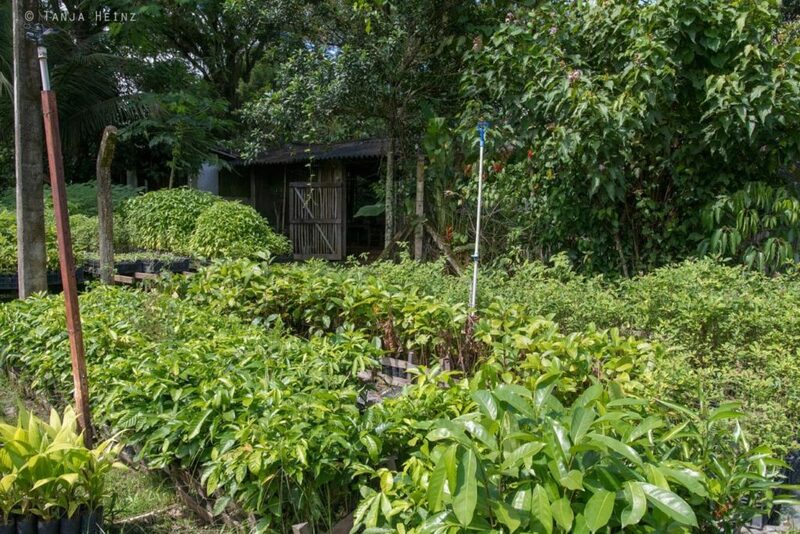 We could also visit the nursery which contributes to the reforestation of the Atlantic Forest. 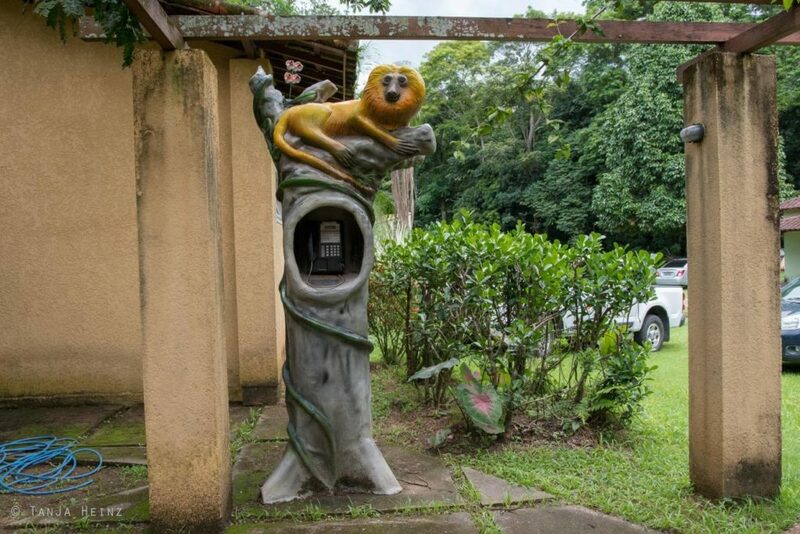 I was impressed with this place as well, especially because people with a very broad knowledge about the Atlantic Forest work with dedication and passion for the conservation of golden lion tamarins. We walked through the nursery. We saw many different plant species. Some were smaller and some were already taller. 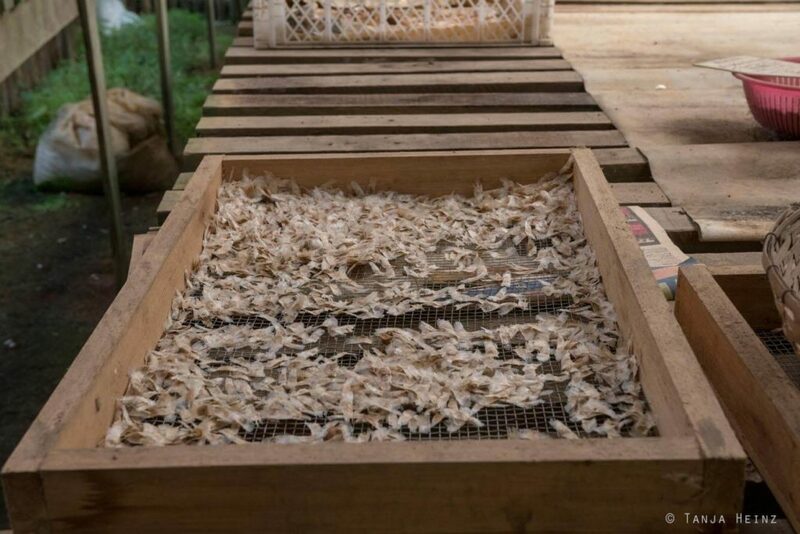 We also saw the place where they dry seeds. 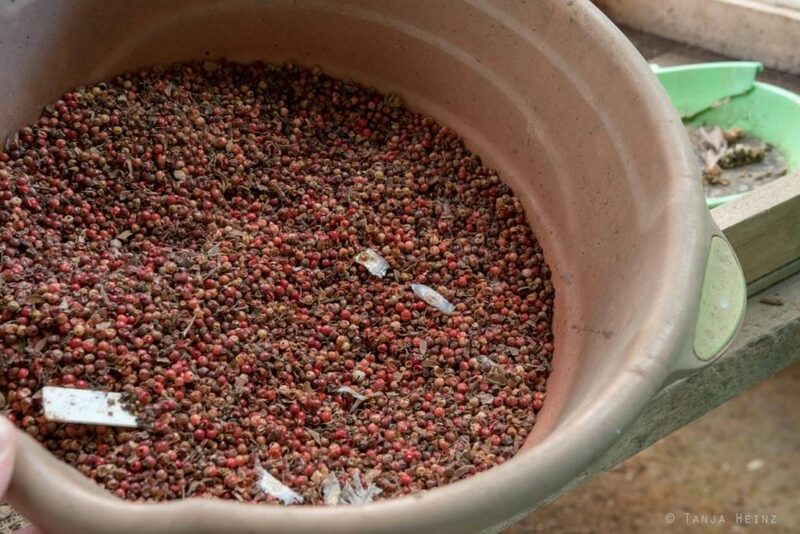 They showed us all different kind of seeds. 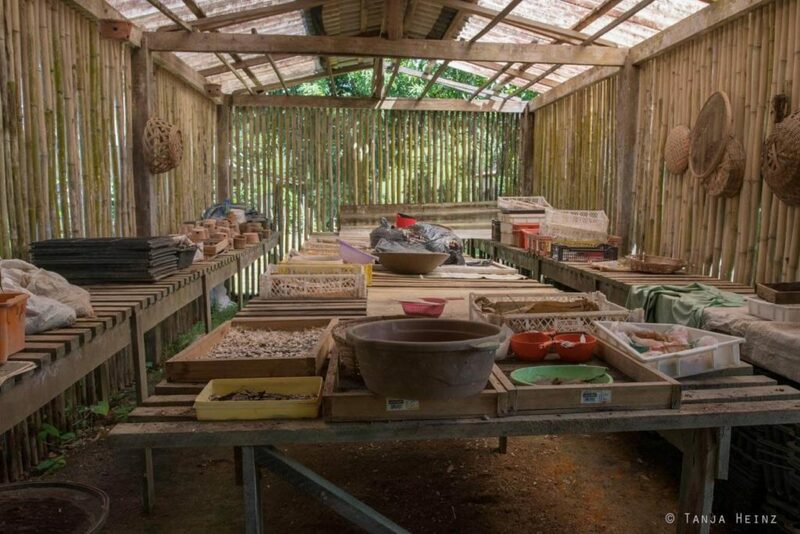 It was so exciting to see so much about the work of the Associação Mico-Leão-Dourado. The nursery was another place where I would have enjoyed to stay for longer. 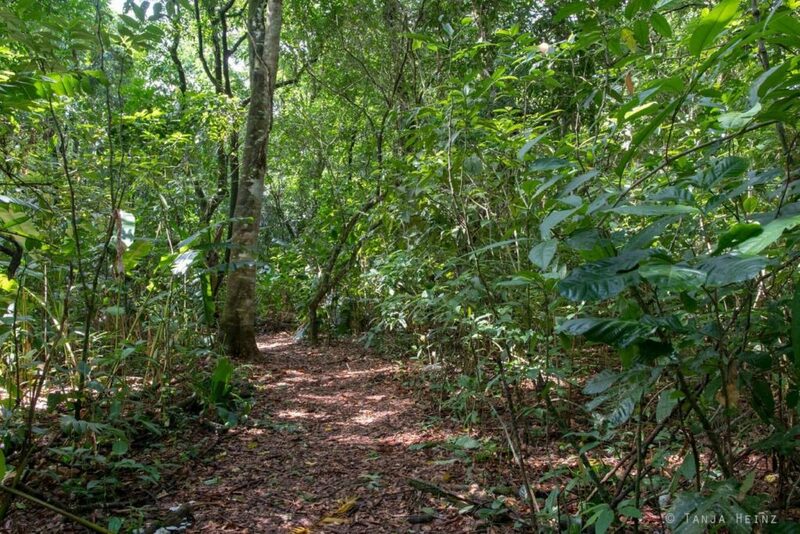 If you visit the Associação Mico-Leão-Dourado it is also worth to see the walking path Boi Branco. The walking path Boi Branco is a path with a length of about 1200 meters. 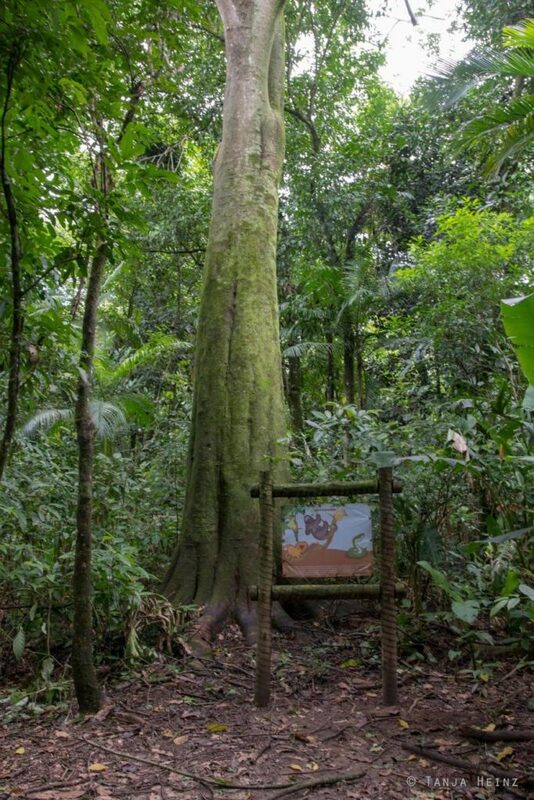 On this path you will encounter several signs with information where you can learn more about the Atlantic Forest. The path was easy to walk. There are two small bridges across a river on the path. As I already mentioned above you will encounter many signs with information about the Altantic Forest. For example, did you know that bromeliads can collect and accumulate water and organic material between their leaves? In this way other organisms like frogs or insects find a niche where they can live. 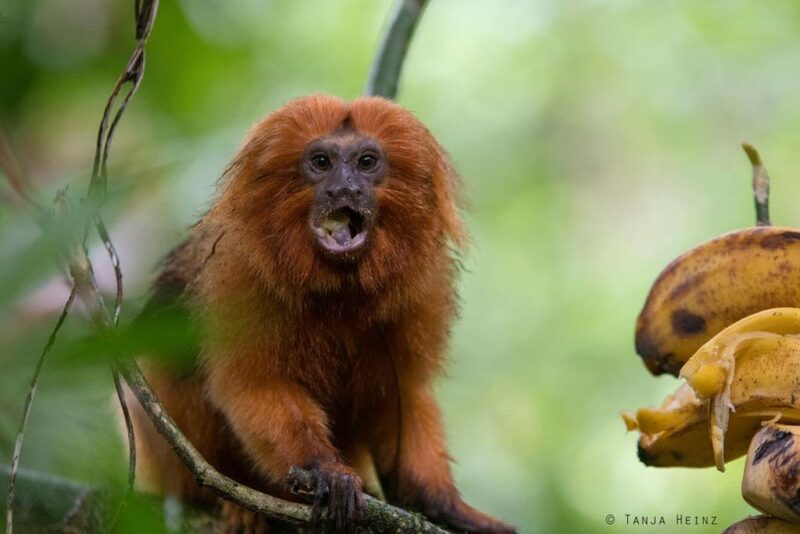 Not only golden lion tamarins live in the Atlantic Forest. Of course there are many more. 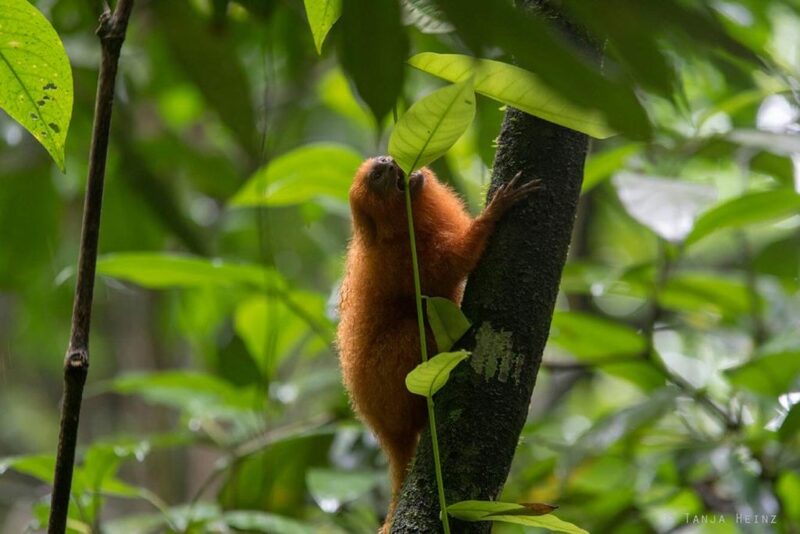 For example mammals like the South American coatis (Nasua nasua), Azara’s agutis (Dasyprocta azarae) and nine-banded armadillos (Dasypus novemcinctus). 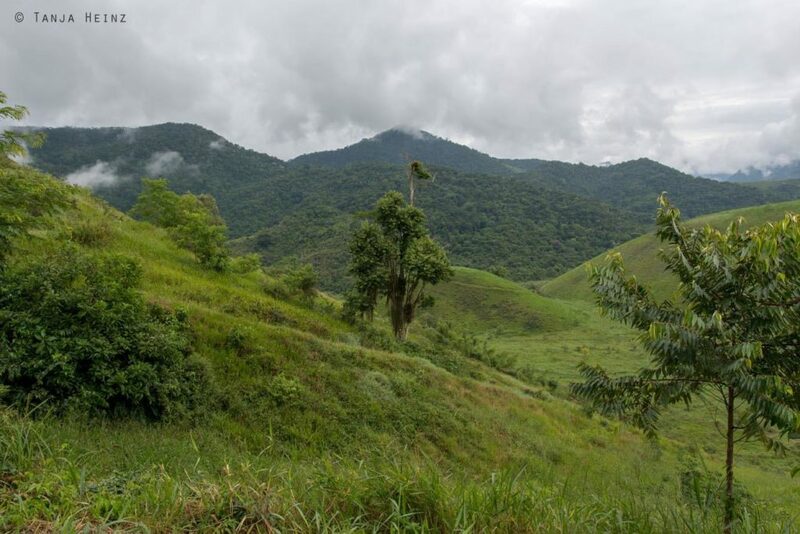 And naturally, many birds live in the Atlantic forest as well like, for example, blue-winged parrotlets (Forpus xanthopterygius) or red-billed curassows (Crax blumenbachii), gray-necked wood-rails (Aramides cajanea), black-fronted piping guans (Aburria jacutinga), green-headed tanagers (Tangara seledon), bare-throated bellbirds (Procnias nudicollis) and saffron toucanets (Pteroglossus bailloni). 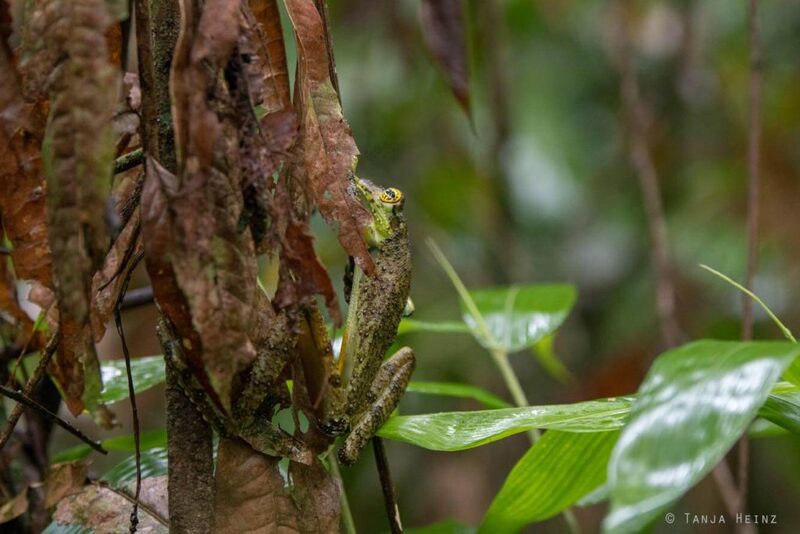 Reptiles like the snake Micrurus lemniscatus carvalhoi and amphibians like the frog Phyllomedusa distincta or the toad Rhinella jimi have also found a home in the Atlantic Forest. 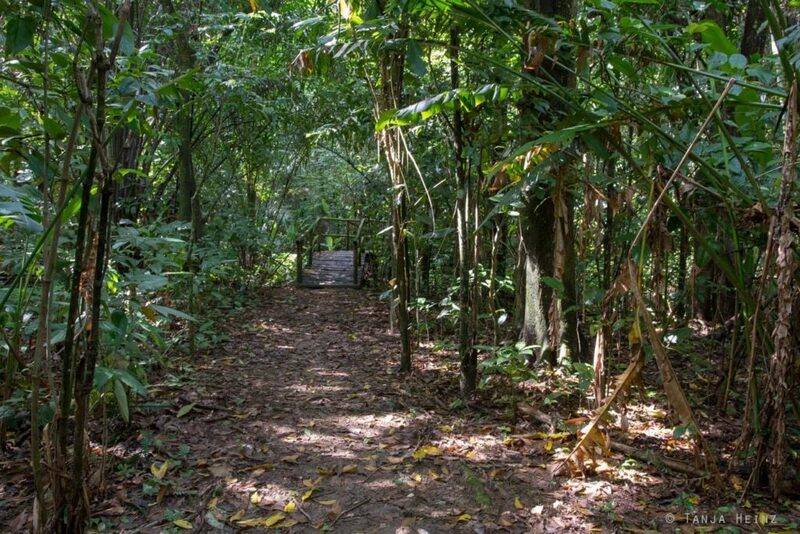 Thus, it is very worth to see the walking path at the Associação Mico-Leão-Dourado. How can you help the Associação Mico-Leão-Dourado? There are different ways how you can help the Associação Mico-Leão-Dourado . 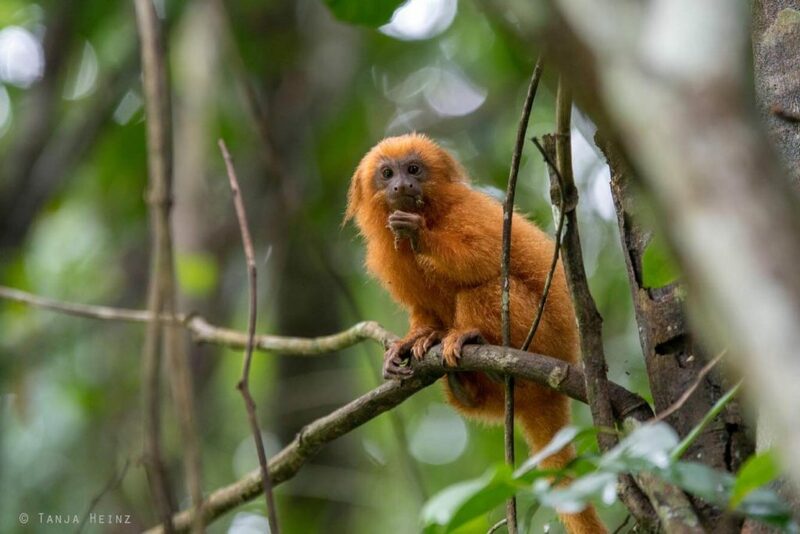 For example, at first you can inform yourself about their work and the golden lion tamarins and share it on Social Media. Furthermore, you can donate to the Associação Mico-Leão-Dourado or buy one of their t-shirts. Another way is to visit the Associação Mico-Leão-Dourado in Rio de Janeiro. 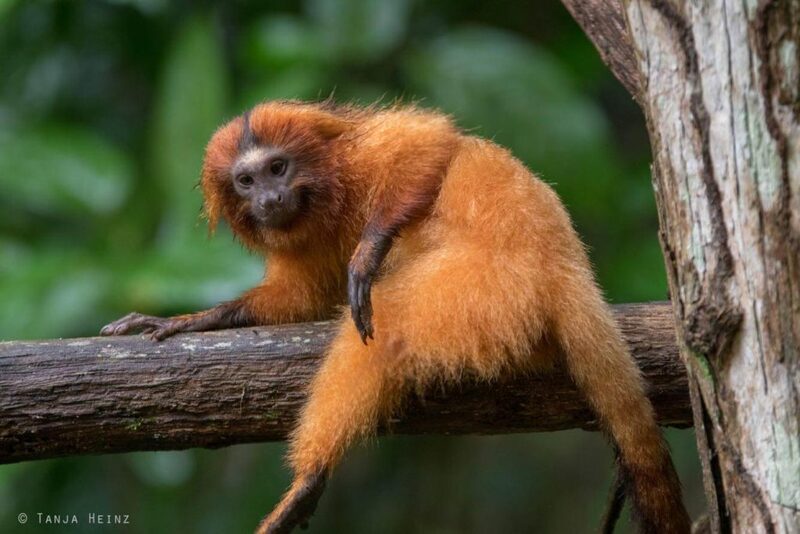 My little contribution today is to arouse your interest about the golden lion tamarins and the Associação Mico-Leão-Dourado. I can tell you that observing these unique animals in their natural environment and not in the zoo is very, very special. 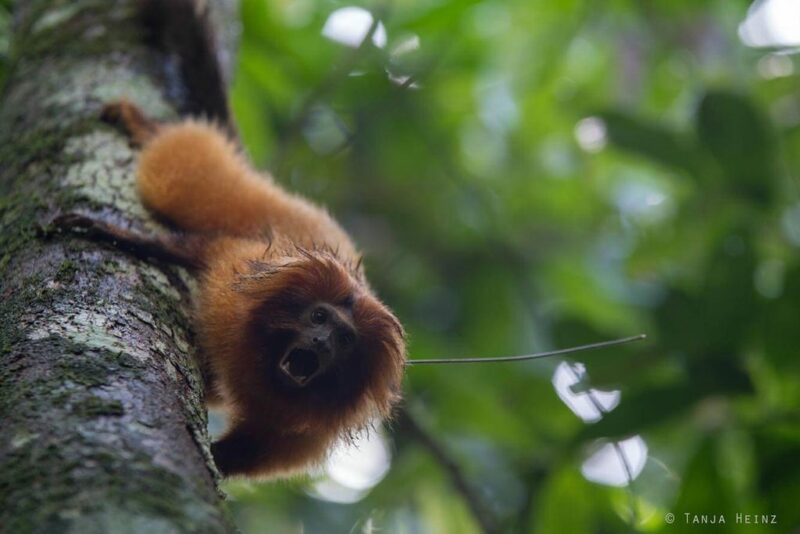 The golden lion tamarins need all attention they can get. They best way to reach Silva Jardim is by car. There is a bus from Rio de Janeiro to Silva Jardim as we asked about a connection at the bus terminal in Rio de Janeiro. However, if you prefer a bus you are less mobile in Silva Jardim. We asked the staff at our accomodation if there are local busses in Silva Jardim. As they recommended us to rent a car, we took a car from Rio de Janeiro to Silva Jardim. We rented a car in Rio de Janeiro at Movida. We went to Movida in the street Avenida Princesa Isabel, 334 – bloco 1 loja b – Copacabana, Rio de Janeiro – RJ, 22011-010. We paid 436.80 R$ for 3 days. We further had to pay 184.00 R$ for petrol which we filled up by ourselves. In Silva Jardim we stayed at the pousada Ipuca. The pousada Ipuca is located at the Rua Álvaro de Souza, 135 – Centro, Silva Jardim – RJ, 28940-000. We paid 618 R$ for two people and 3 nights. Breakfast was included. We were the only guests on those three days. We felt very home in the pousada. The rooms were very comfortable and clean. As we had to wake up very early to see the golden lion tamarins, we were very grateful that the staff at the pousada prepared breakfast earlier as they usually do. 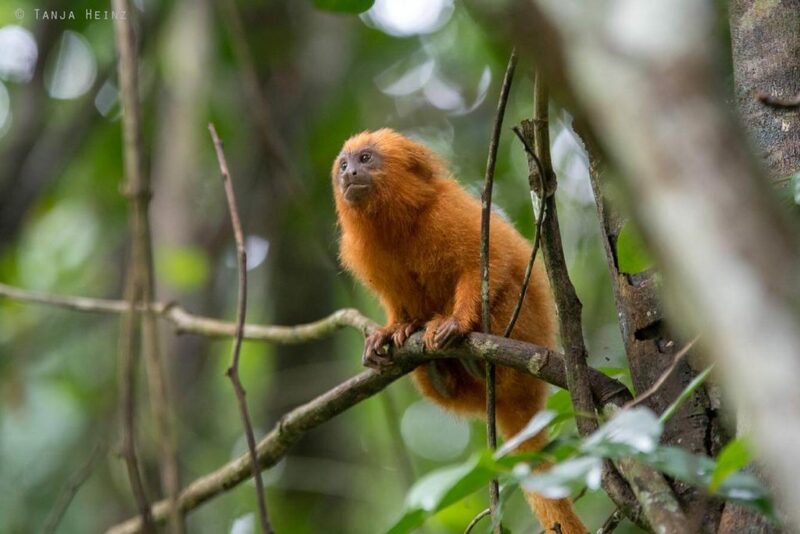 You can find more information about the golden lion tamarins and how you can observe them with the Associação Mico-Leão-Dourado on their website (in Portuguese).